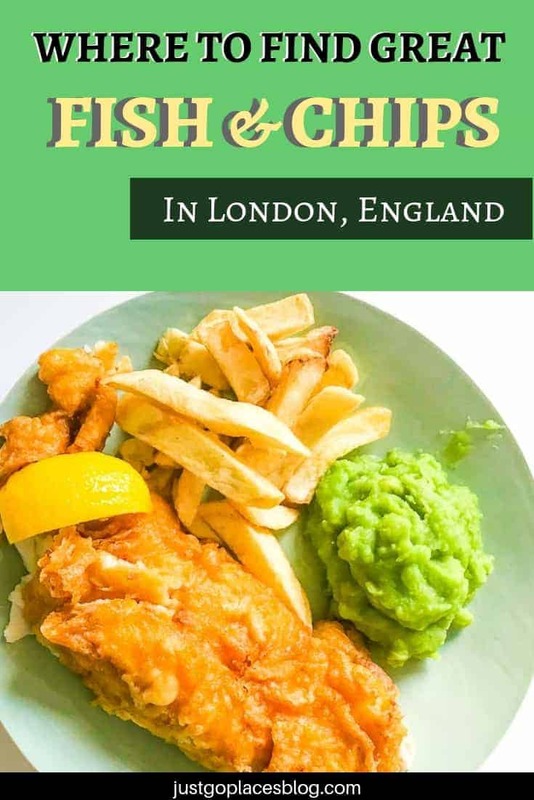 In honour of the second International Mushy Peas Day, we visited a restaurant well-known for having one of the best fish and chips in London. 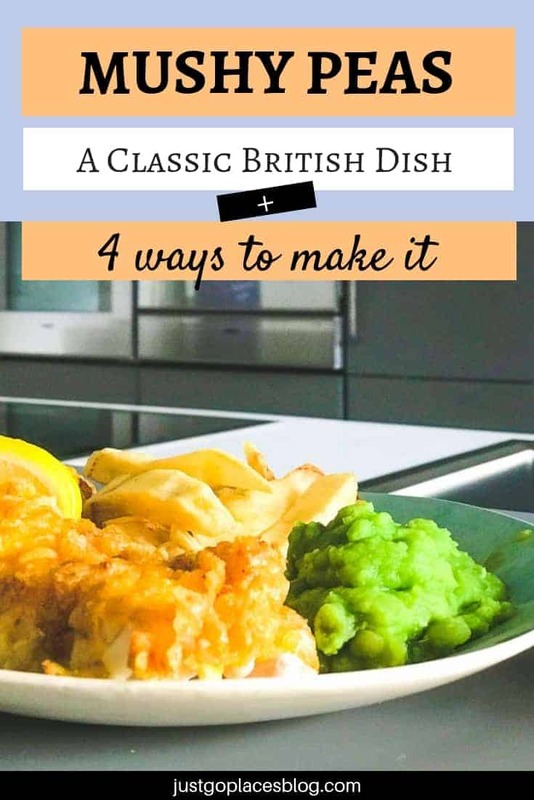 After all fish chips and mushy peas are a classic British dish. It seems like something you either love or hate, like Marmite. My son loves mushy peas, my husband hates them. I think they just taste like a solid form of split pea soup. 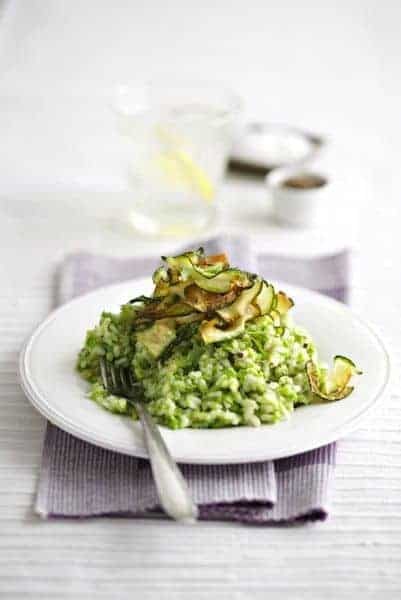 You can have traditional mushy peas or use them to jazz up other dishes like a burger or risotto. So just when you thought they couldn’t come up with any more gratuitous holidays, November 9th is now the International Mushy Pea Day. I’m OK with celebrating food though (even the humble pea). First things, first. What is mushy peas? 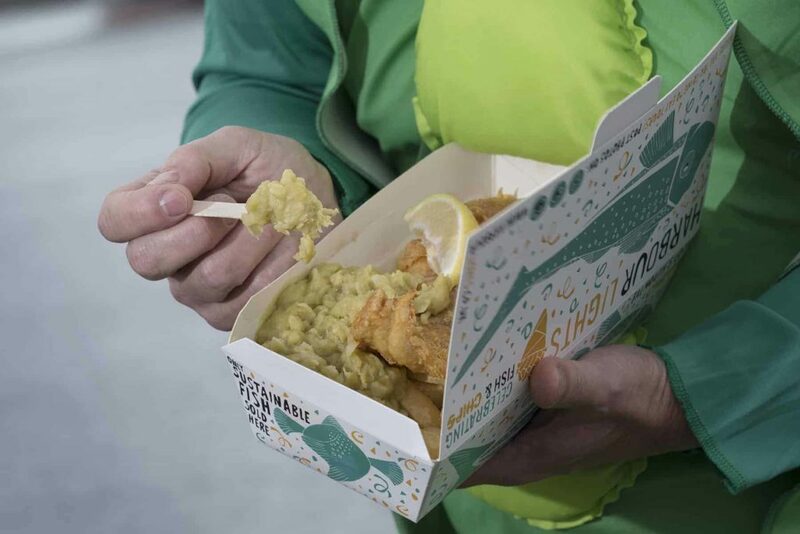 Mushy peas really are just that – a glob of cooked peas seasoned in salt and sugar mushed together. Mushy peas are a classic side dish in the North of England. They’ve earned their nickname of being Yorkshire’s caviar by accompanying many a fish and chips or pie meal. It’s the obligatory green vegetable bit that makes you feel better about all the fat and salt in the rest of the meal. There’s an apocryphal story about Labour politician Peter Mendelson who was trying to shed his city slicker image and be one of the regular folk. Unfortunately, on a trip to Yorkshire he ordered fish and chips with a side of the “avocado dip”. He has denied the story but the Peter Mandelson avocado story is just too good to disappear. Do you know there are even mushy pea recipes that make mushy peas curry? 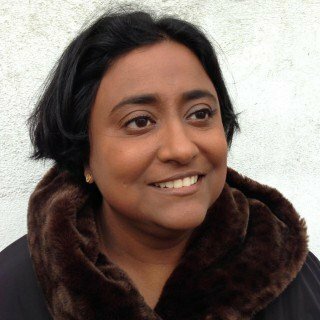 The British have embraced and adapted Indian food totally. I like this simple easy-to-make mushy pea recipe for mushy pea curry that shows off the best of British Asian fusion food. A traditional mushy pea recipe calls for dried marrowfat peas to be soaked in baking soda overnight and then simmered in salt and sugar until they form a green mush. Appetising (to some). Here is the basic traditional recipe for mushy peas. If you want to go non-traditional, you can use mushy peas to make burgers, risottos and tarts. I’ve always loved risotto with peas so I am partial to this mushy pea recipe that adds a pea puree to risotto. 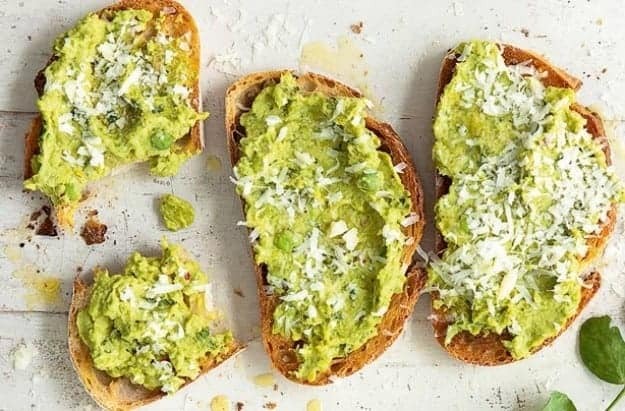 Why have avocado toast when you can have peas on toast? Here’s a cool variation on the ubiquitous millennial dish. Can you blame Peter Mandelson for (allegedly) mixing up avocados and mushy peas? Are Mushy Peas Good For You? Well, it’s not bad. There are about 87 calories per 100 grams. It’s also low in fat but provides proteins and carbohydrates. Other essential nutrients include iron, zinc, potassium and fibre. Go on. Have some mushy peas. Maybe they will be your new avocado substitute. If you want to try a classic British dish, then fish chips and mushy peas are the way to go. 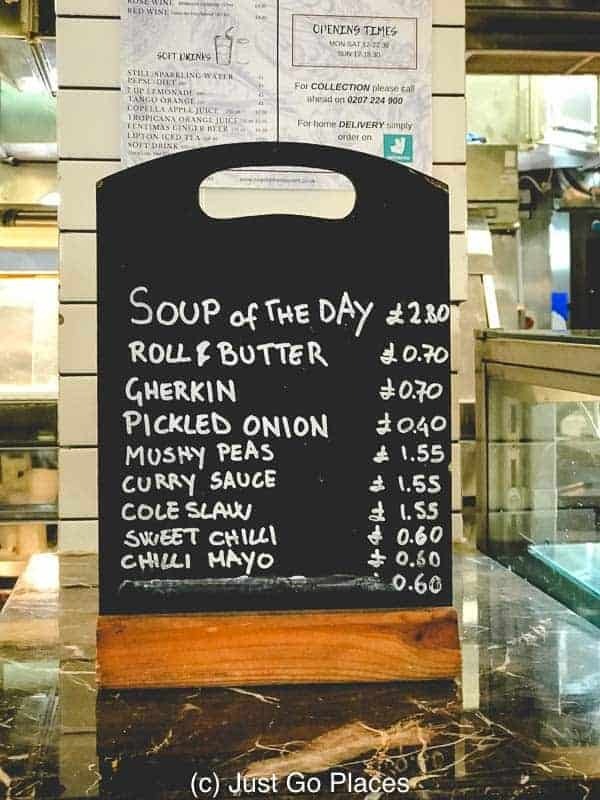 They are many options for fish and chips in London at many price points. Here are out three favourite options, including the obligatory cheap and greasy joint. I am not big on deep fried food and/or anything wrapped in newspaper. My pores break out just thinking about it. So you know, the fish and chips have to be good to get a pass from me! Fish and chips are Friday school lunch classic in British schools. Even my non-fish eating daughter was fine with Fish Finger Fridays (probably because there was hardly any fish in the versions she was served). Our vote for the best fish and chips in London goes to the Seashell of Lisson Grove located in Marylebone. It’s been around for 50+ years (e.g, supposedly Princess Di would send her driver to Seashell Lisson grovefor takeaway back in the day). There’s a take away and casual dining place on the corner of Lisson Grove as well as a fancier restaurant next door. 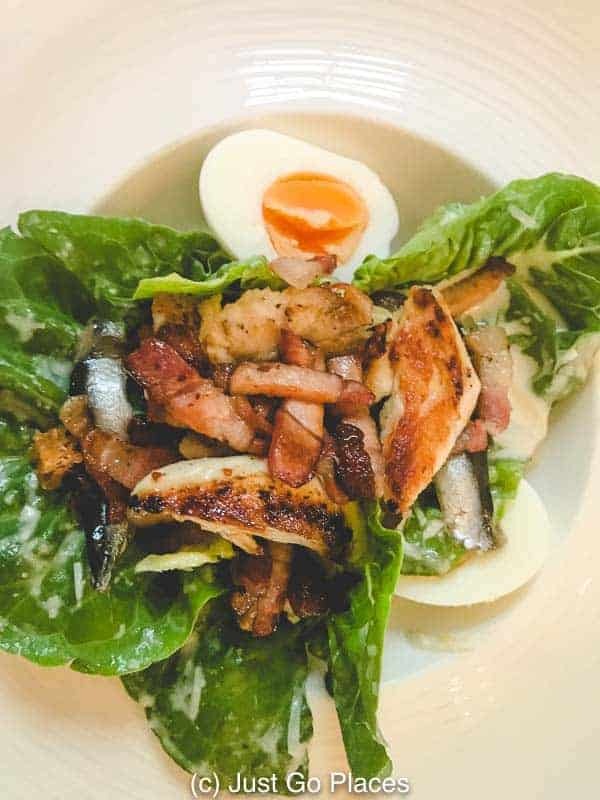 The Seashell of Lisson Grove menu has an extensive choice of fish. My friend went on a quest to find the most ‘authentic’ and best fish and chips in London. His methodology was simple. He asked every cab driver he met. The most recommended was The Fryer’s Delight (19 Theobalds Road, London WC1X 8SL) near Holborn. He loved it – basic, delicious and cheap. Personally, I thought it was too greasy. 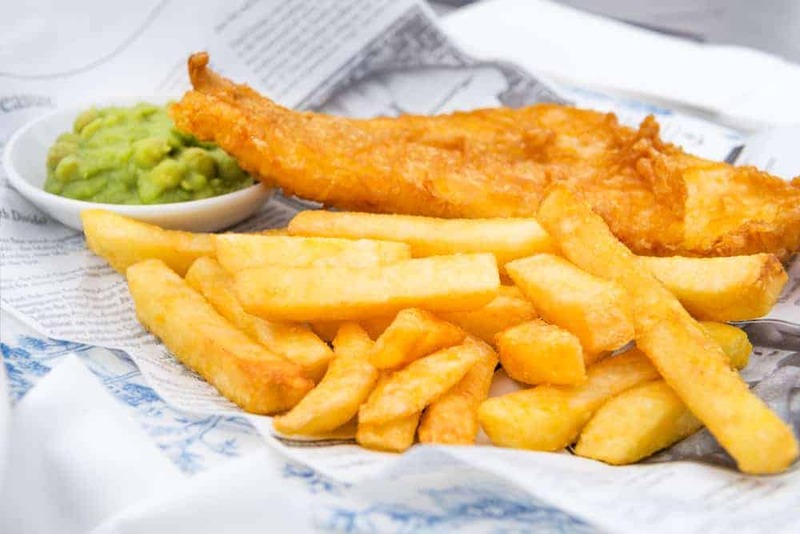 Another good option for a retro-cool ambience is Poppies Fish and Chips London which has outposts in three locations now. 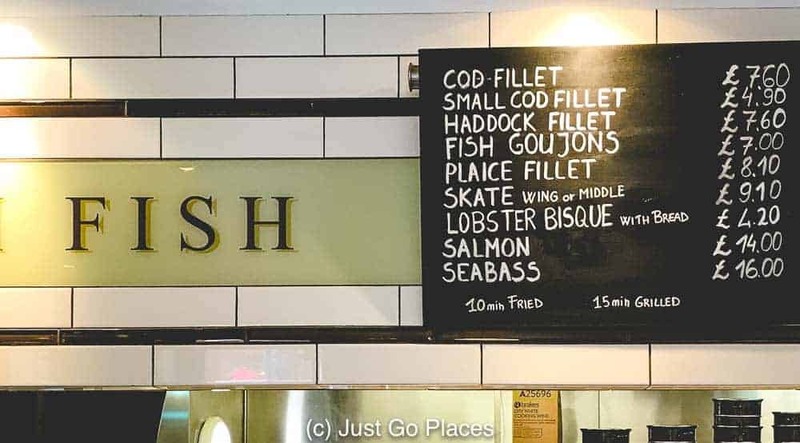 In addition to the original location in uber-cool Shoreditch, it’s also got outposts now if you are craving fish and chips in Camden and Soho. The owner has been serving fish and chips for decades in the East End before gentrification pounced upon this working class neighbourhood. Anyway, we didn’t choose the fish and chips in Camden because they didn’t serve mushy peas. risotto. 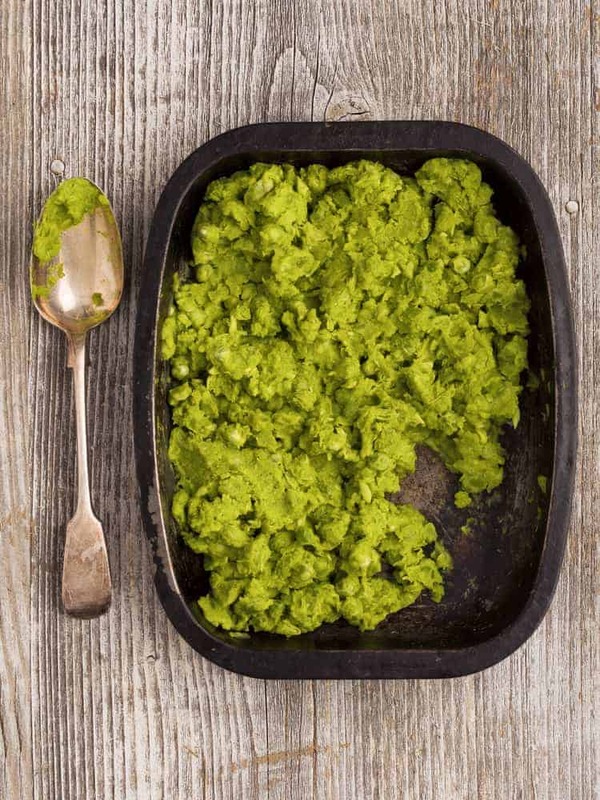 Check out these mushy peas recipes & ideas. 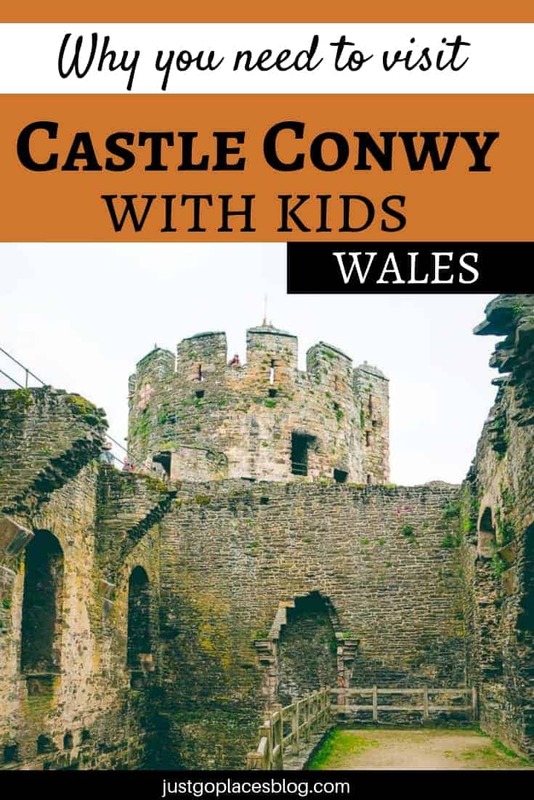 If you are in the Conwy North Wales area in the spring, lucky you! 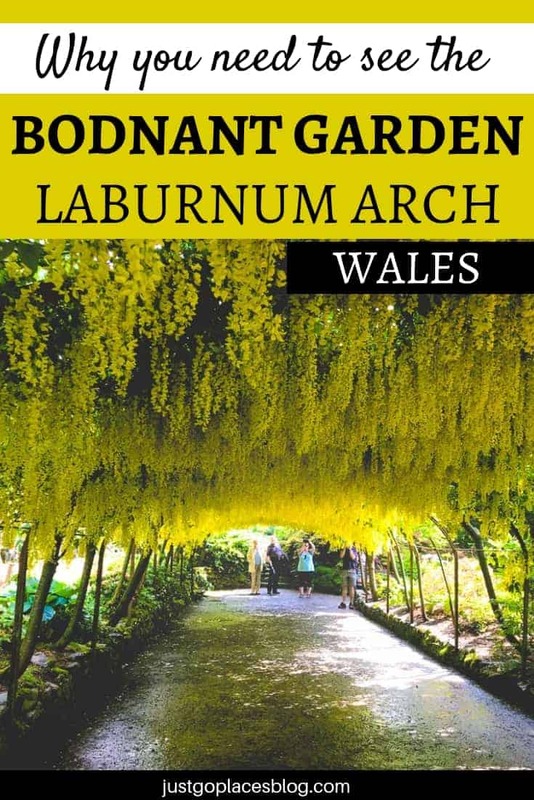 Make sure you swing by the National Trust property, Bodnant Gardens to catch its famous Laburnum Arch in bloom. 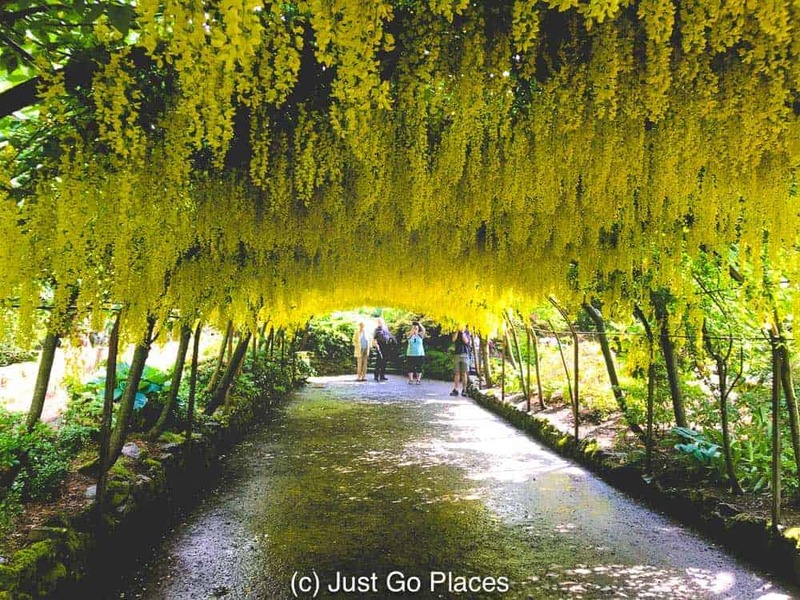 Planted during Victorian times, the Bodnant Gardens Laburnum Arch is a golden tunnel of blossom and sunshine. Also part of the Bodnant Estate, a stroll around the gardens should be followed up by a visit to the Bodnant Welsh Food centre. 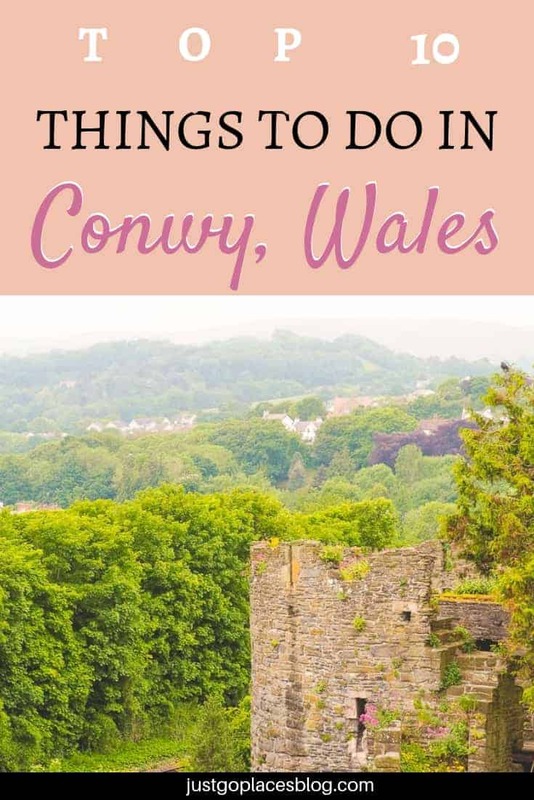 It’s readily apparent to even the most casual visitor why these gardens are considered the best in Wales. 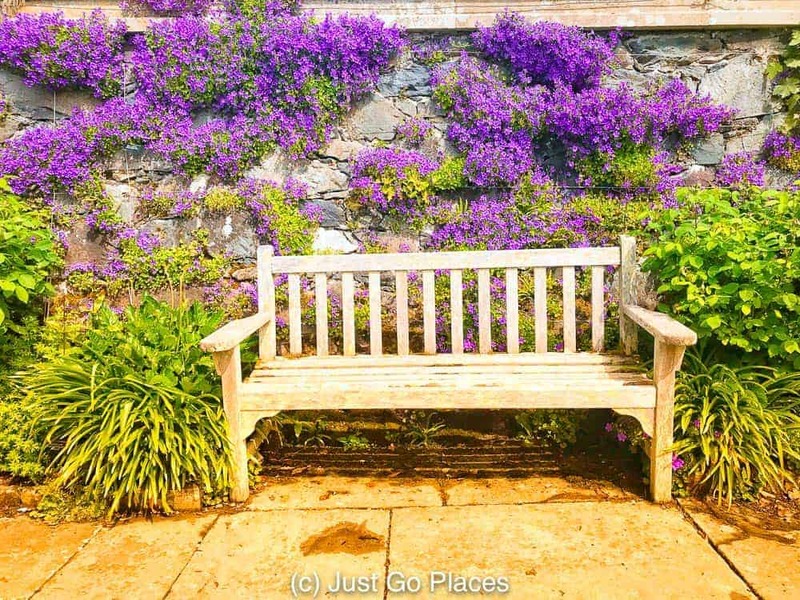 If you enjoyed visiting the Italianate village of Portmeirion, then you will love Bodnant Gardens Wales as well. 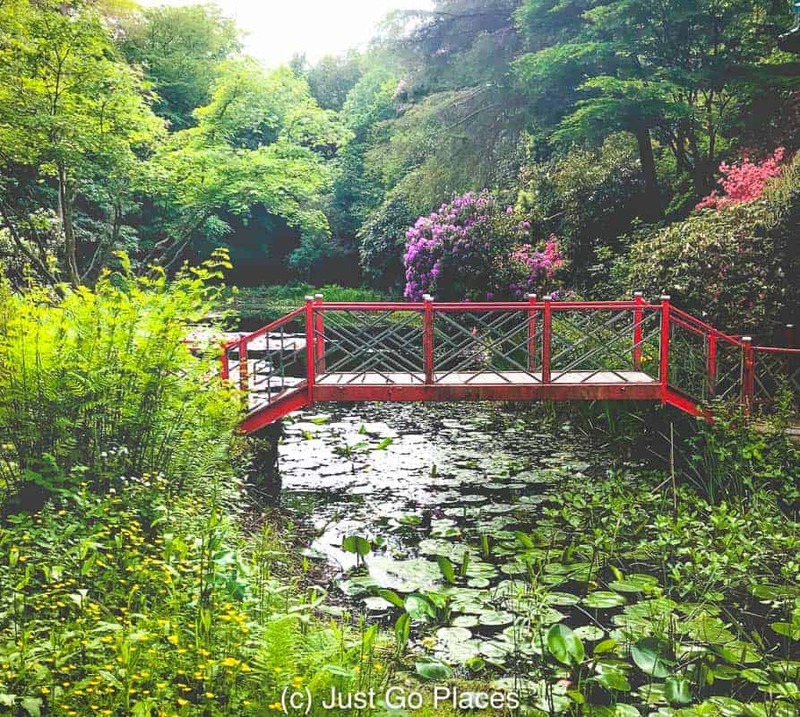 Covering 70 acres, Bodnant Gardens has plenty of space to explore and to find your own private idyll. There are paths that meander through wildflower meadows, lakes, and woodland. The Bodnant Gardens are framed with distant views of Snowdonia National Park. Woodland, wildflower meadows, Italian gardens. 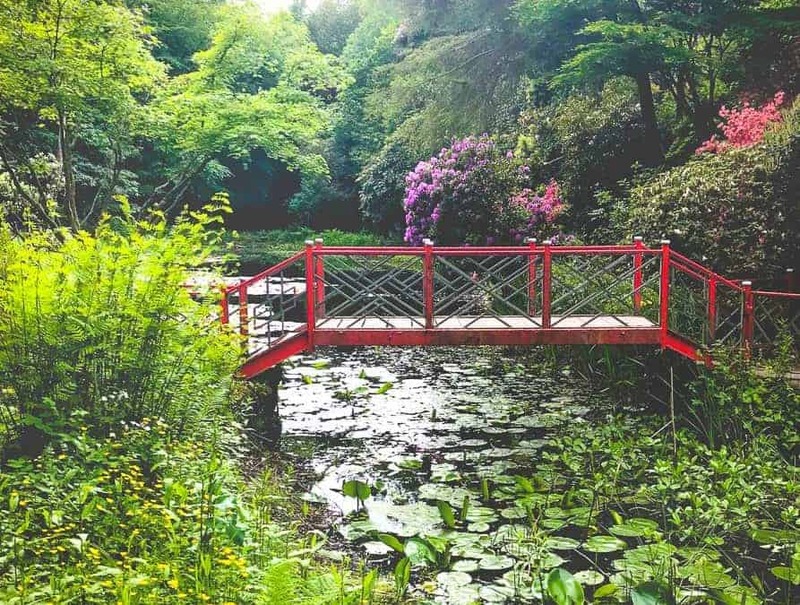 Bodnant Gardens are a visual feast. Stark and rugged Snowdonia is the exact opposite of this carefully-tended garden but both are beautiful in their own way. 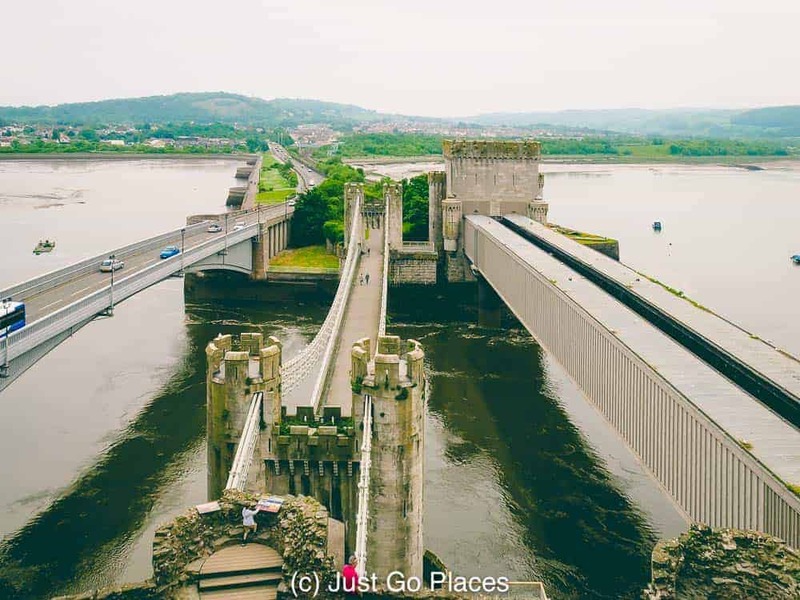 Located near each other, it is easy to appreciate both natural and man-made beauty in this little corner of North Wales. The Bodnant Garden Centre is huge and sells some of the varieties of plants available. Sorry no nearly 150-year old Laburnum arches for sale. Not even a snow-globe version! There is a manor house on the Bodnant Estate which is not open to the public. You know the Bodnant Gardens have to be something special for a house this impressive to not be the main attraction of the Bodnant Estate. Pretty Bodnant House but it’s not open to the public. Even if you miss the Bodnant Gardens Laburnum Arch, there are plenty of other floral attractions during the year – daffodils start off the show in early spring and are followed by rhododendrons and azaleas. 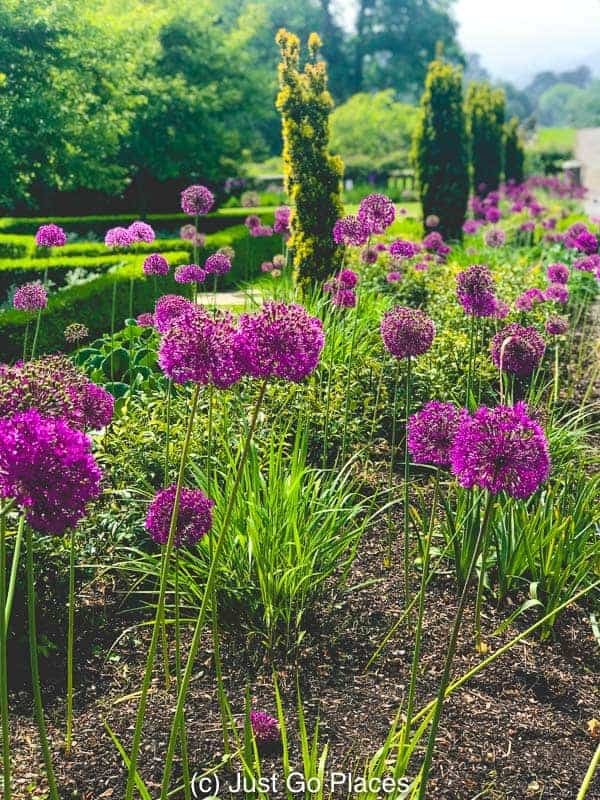 In summer, Bodnant Gardens is abloom with the best of British gardens – roses, clematis and hydrangeas. Then roll on the fabulous colors of autumn with the Acers. 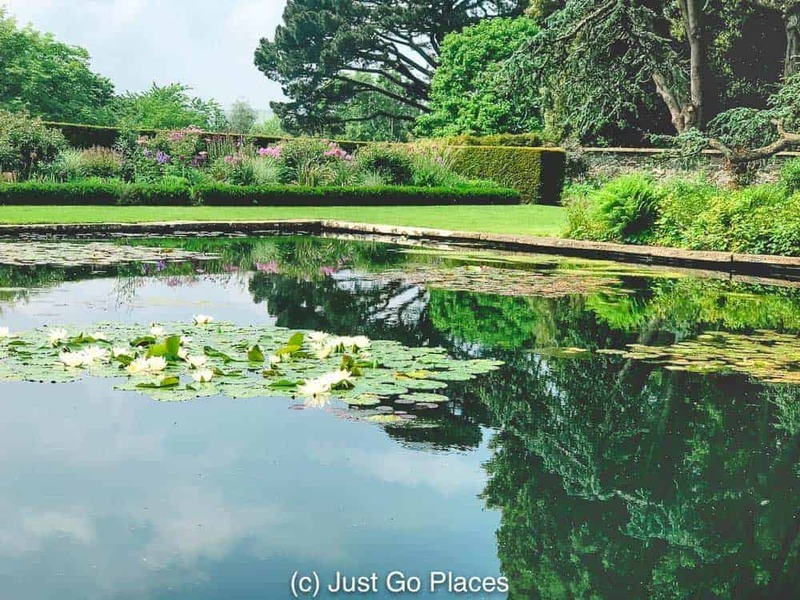 In summer, the water lilies come into their own on the Bodnant Estate. 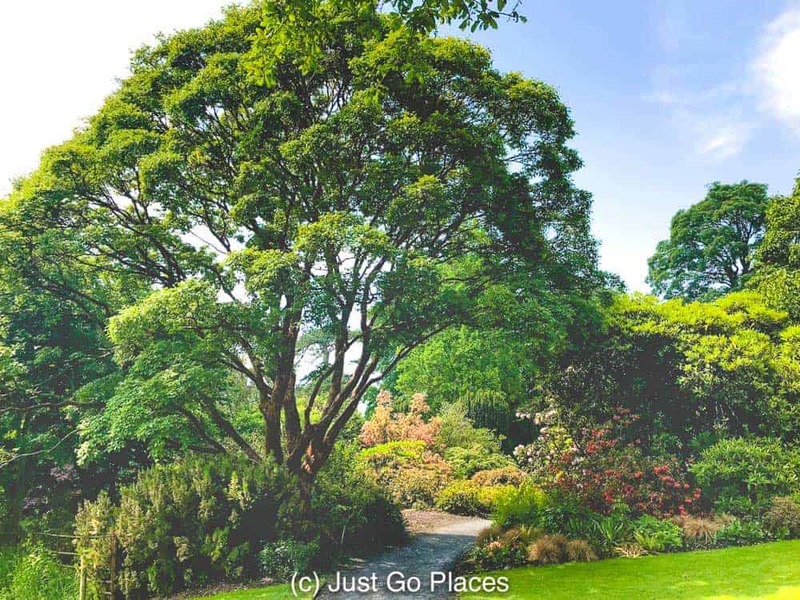 Check out the excellent TripAdvisor reviews for Bodnant Gardens! Planted in 1880, the Bodnant Laburnum Arch has been a labor of love for many generations of gardeners. It reminds me of the Archignassio in Bologna where every scholar in that case (or gardener in this case) does their part to create something great that will outlast them all for the benefit of people far in the future. 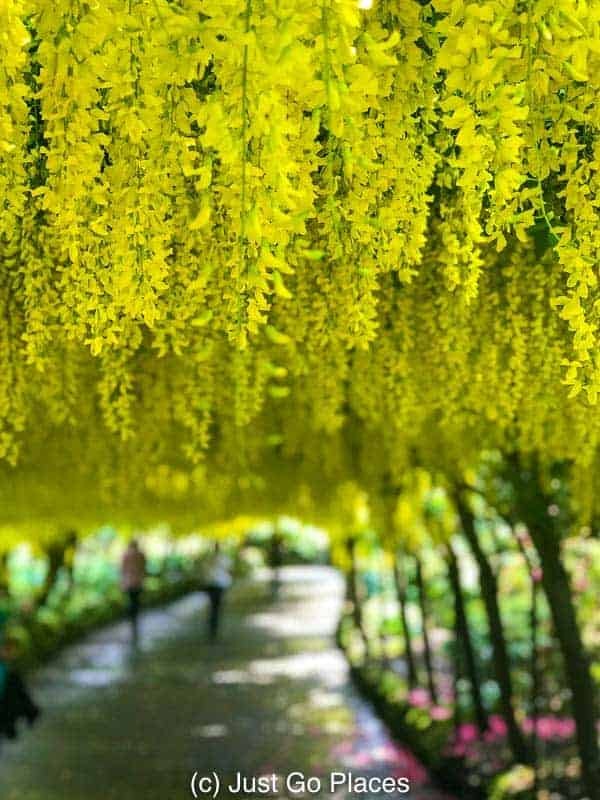 The Laburnum Arch at Bodnant Gardens is a 55 meter golden walkway. 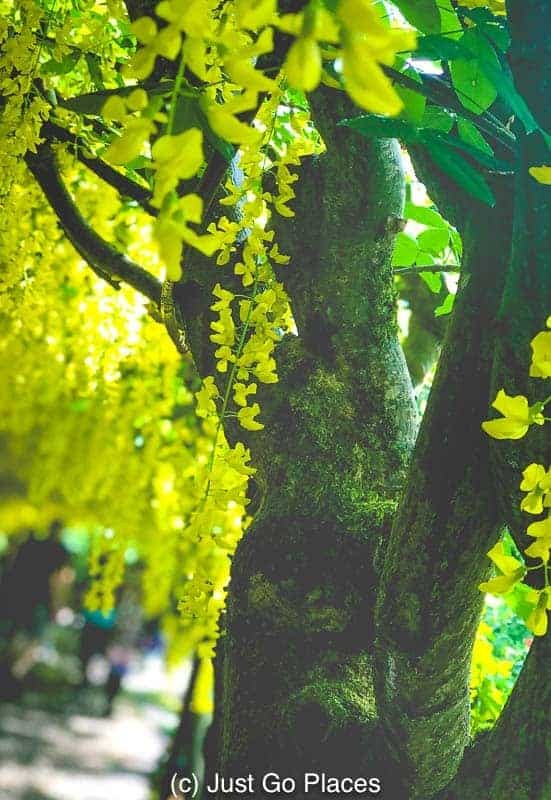 The nickname for Laburnum is ‘golden rain’ because of the way it droops down. Laburnum foliage glows almost fluorescent yellow against the milquetoast blue of a British sky. You can see why Laburnum is nicknamed Golden Rain. 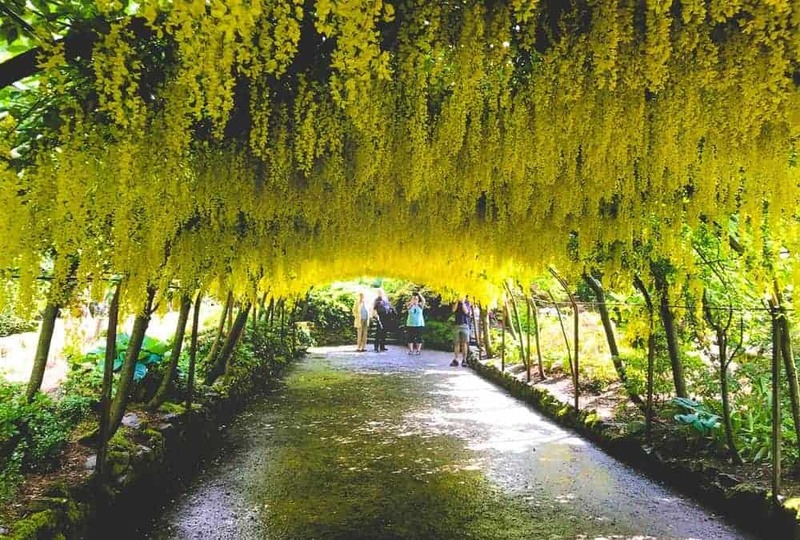 During the 2-3 weeks Bodnant Gardens’ Laburnum Arch is in bloom in late spring, approximately 50,000 visitors come to see the arched walkway. That’s almost a 1/4 of the 200,000 visitors the Bodnant Gardens Wales gets annually. These Laburnum trees were planted in 1880! The Bodnant Gardens Laburnum Arch is supposed to be the oldest and longest in Britain. It takes 2 gardeners 5 weeks in January to prune the Bodnant Gardens Laburnum Arch to maximise its glory in spring. After the big show, 2 gardeners are needed to deadhead the flowers in July. 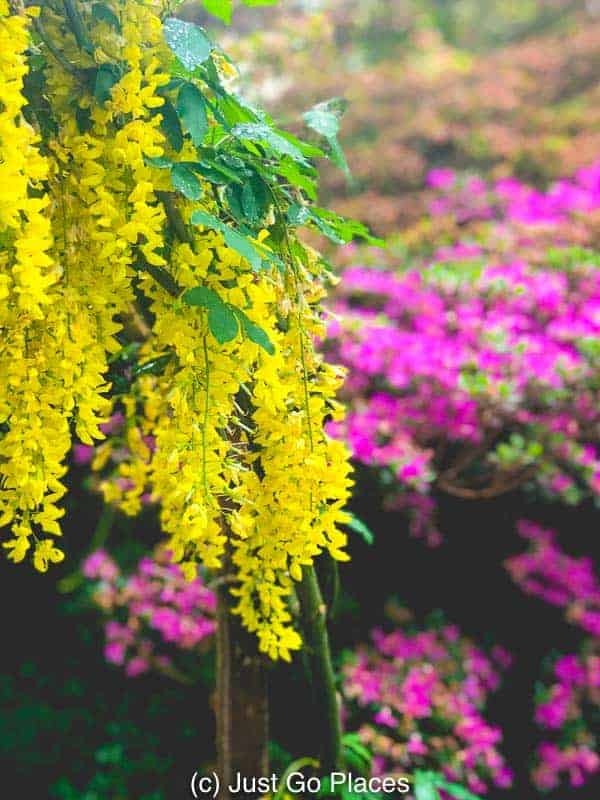 The vibrance of the Laburnum contrasts with the other colors of the garden. 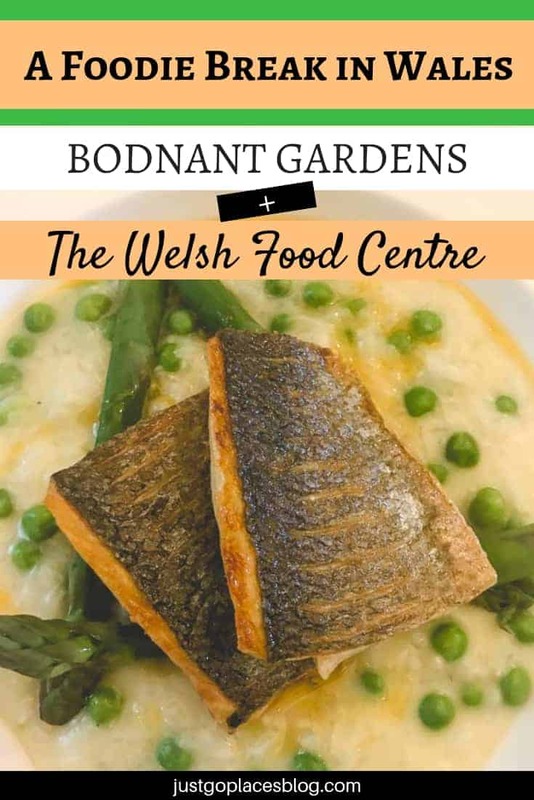 After exploring Bodnant Gardens, the best way to cap off the experience is to visit the Bodnant Welsh Food Centre which is part of the Bodnant Estate. 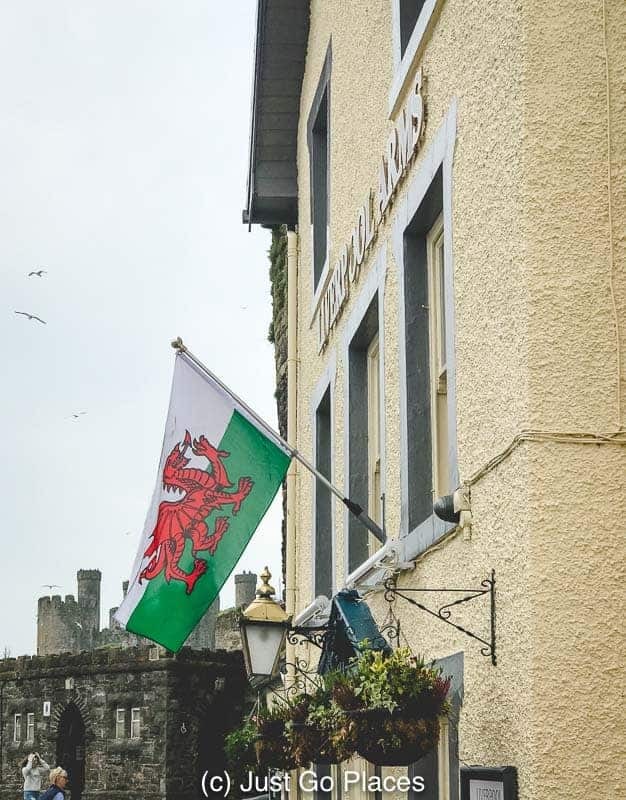 As we knew from our previous experiences in Wales, the Welsh countryside has really amped up its foodie credentials with great local restaurants and homegrown celebrity chefs. The Welsh Food Centre is another foodie heaven devoted to locally sourced farm-to-table fare. 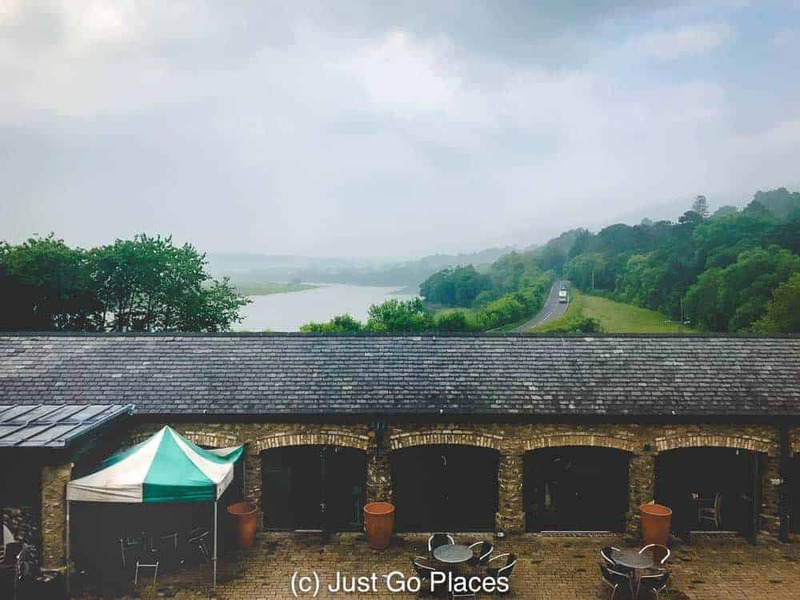 It’s fairly comprehensive enterprise with the Bodnant Farm Shop, Furnace Tea Room, Hayloft Restaurant and Furnace Farmhouse. The Furnace Tea Room is set in the old stables and perfect for a light lunch or afternoon tea. The Furnace Tea Room with the Conwy valley stretching out behind it. The Hayloft Restaurant is a more formal experience for lunch and dinner. We went with our children for lunch and did not find it stuffy. The food was delicious!! And, my little fussy vegetarian child found a dish to make her happy. A salad starter at the Welsh food centre. In terms of Bodnant accomodation, you can stay at the Furnace Farmhouse. Dating the 18th century, there are 6 rooms available for rent. Like the rest of the Bodnant Food Center, the decor and amenities cater to modern sensibilities. Think charming modern farmhouse style that’s discreetly luxurious. If you are in the Conwy North Wales area in the spring, lucky you! 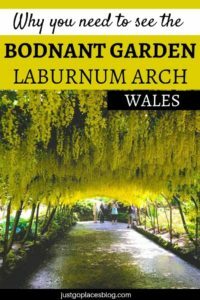 Make sure you swing by the National Trust property, Bodnant Gardens to catch the famous Bodnant Gardens Laburnum Arch in bloom. 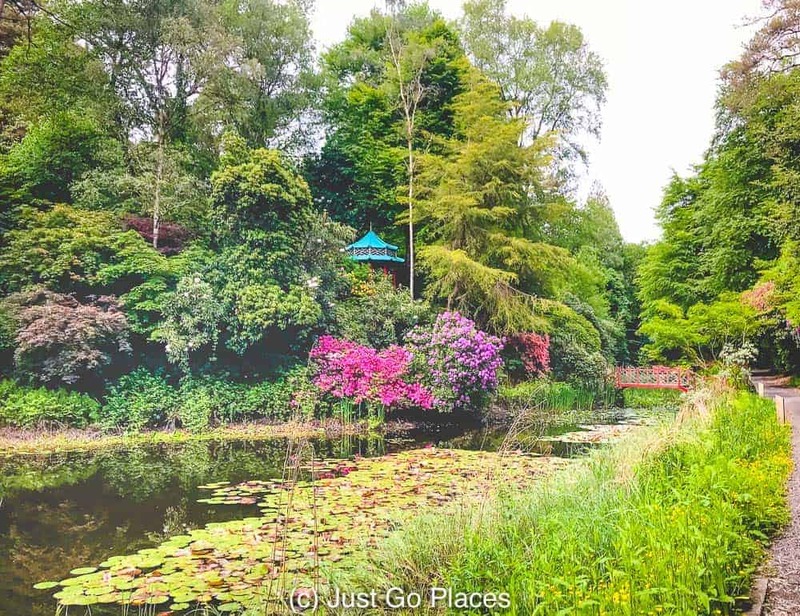 Discover why you should visit Bodnant Gardens, North Wales, in the spring. Stepping into Portmeirion in Wales was like crossing the border into a fantasyland. Impossibly pretty and somewhat unreal. I knew I was still in Britain (cloudy skies, chill in the air) but the colors and architecture of Portmeiron village were the pastel-candy hues I associated with the Mediterranean (and gelato!). Of course, Portmeirion Wales had to be the creation of a rich English architect. 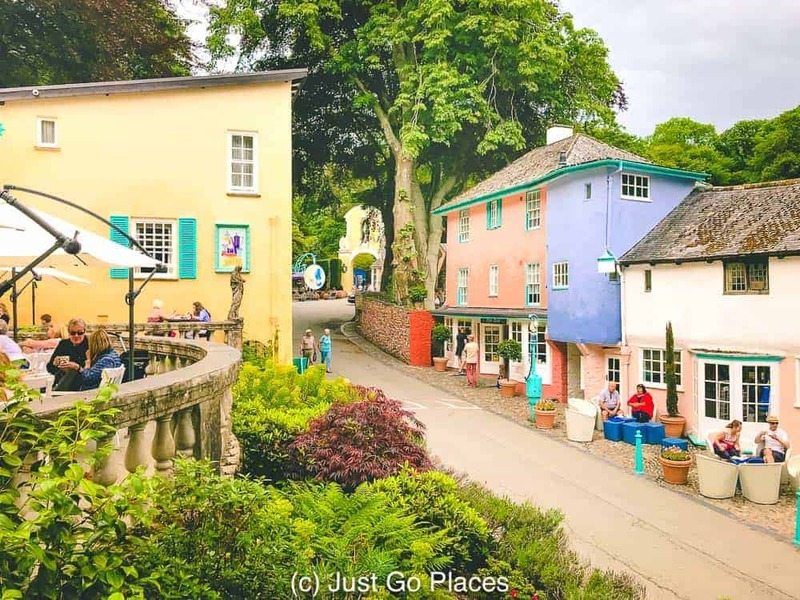 I can imagine Portmeirion Italian village is exactly Prince Charles’ cup of tea – pretty and traditional. 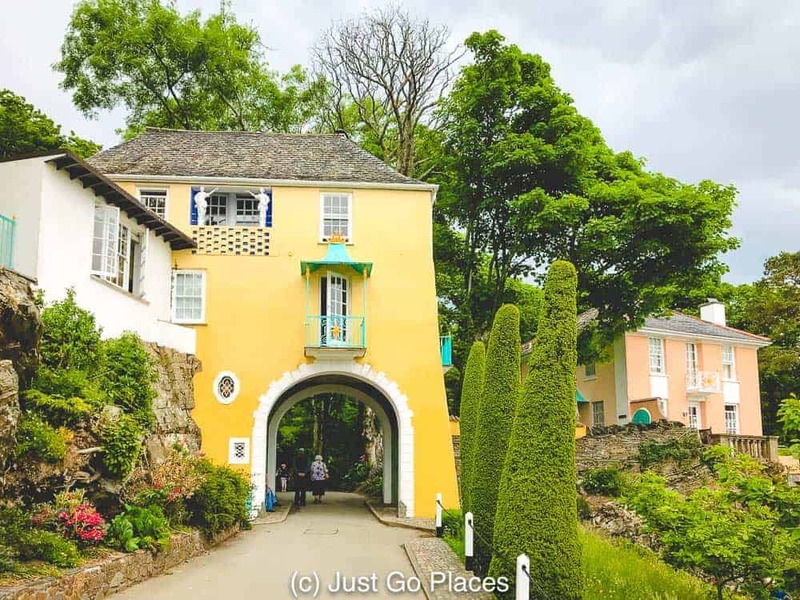 Despite our misgivings, we were charmed by the idyllic location of the Portmeirion Hotel located on the edge of the water, the Portmeirion cottages sprinkled throughout the village and the little green Portmeirion train chugging through the woodland. You’d have to be a real grump not to be enveloped in this Italian coastal fantasy. The grand vision of architect Clough Wiliam-Ellis, Portmerion village was built as an homage to his love of another coastal village, Portofino in Italy. He wanted to show how to develop an area while still keeping it beautiful. Built over 50 years (1925-1975), the entirety of Portmeiion village is Grade II listed. The Portmeirion entry free goes towards the upkeep of Portmeirion Village. 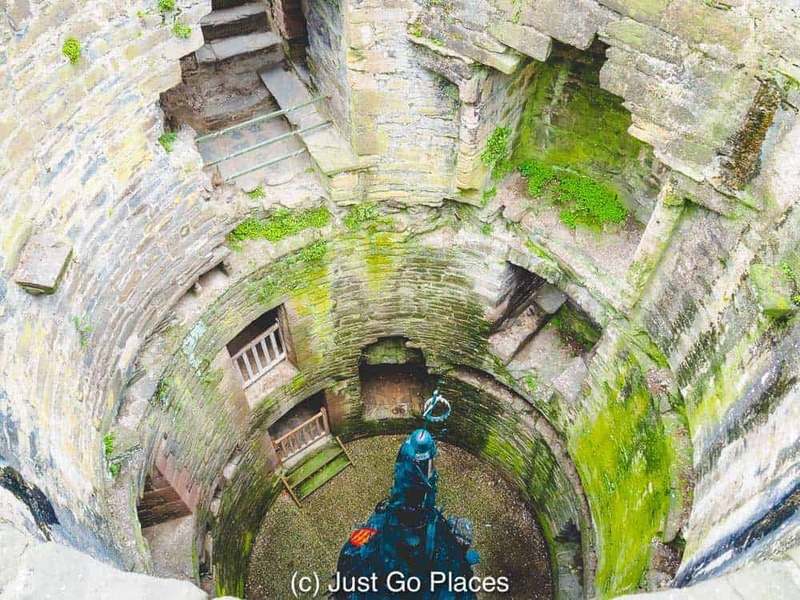 Lonely Planet listed Portmeirion in Wales as a top destination on its Ultimate Travelist for the entire world. It gets over 200,000 visitors every year! Portmeirion Italian village in style, but the British crest lets you know where you are. Frank Lloyd Wright (of Welsh ancestry) came to visit Portmeirion Wales in 1956. Needless to say, it is a very popular place for weddings and other celebrations in North Wales. Somehow the pastel colors of sun-drenched Italy still works in somewhat grey North Wales. You won’t run out of things to do in Portmeirion Wales. With its its close proximity to Snowdonia National Park, even the most hard-core outdoors person will find themselves happily occupied. 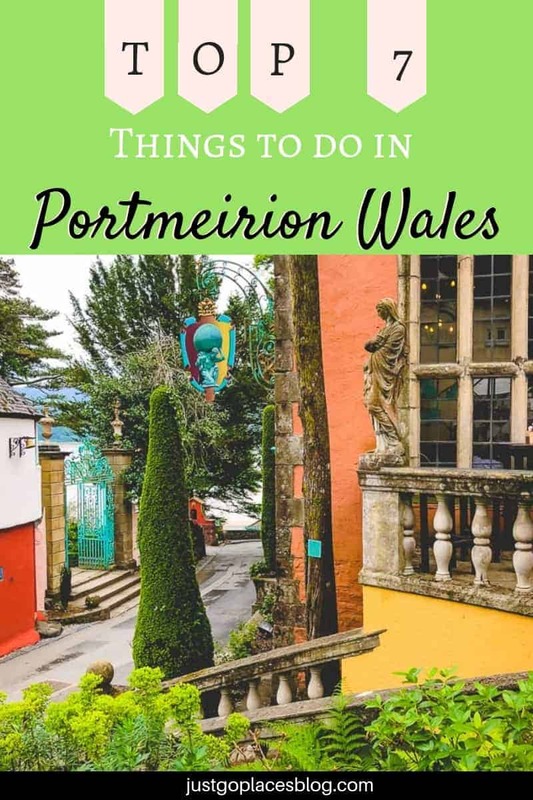 With so many things to do in Portmerion Wales both in the village complex as well as outside, Portmeirion in Wales is a great destination for a multi-generational holiday. Check out the reviews for Portmeirion on TripAdvisor. 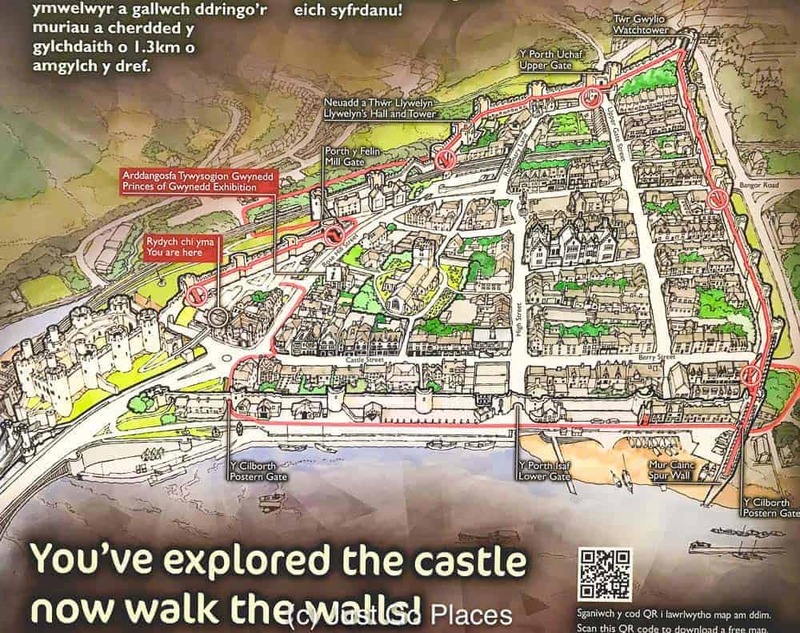 The Portmeirion map shows how convenient the whole site is. 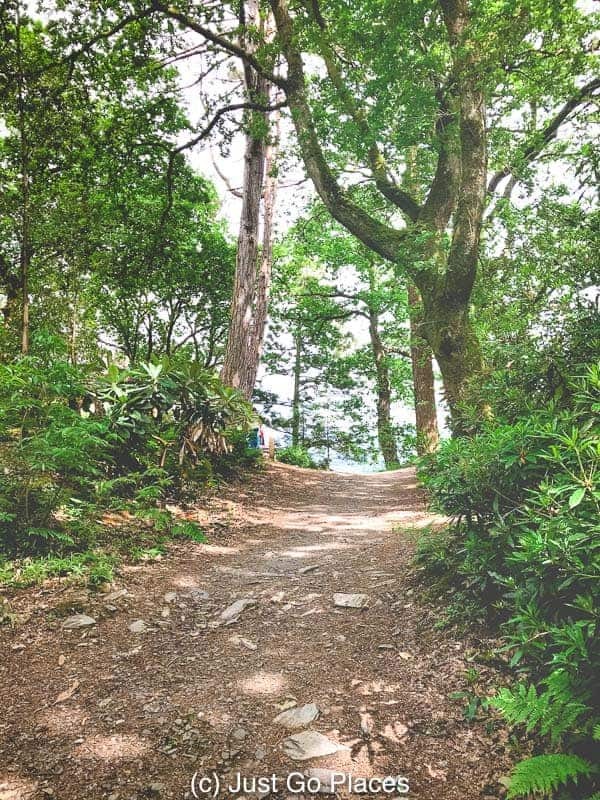 Portmeiron in Wales is set amongst 70 acres of forests set with 20 miles of walking paths for communing with nature. In addition to the general walks, there are specific coastal walks and woodland walks, each of which would take you about 30-40 minutes. 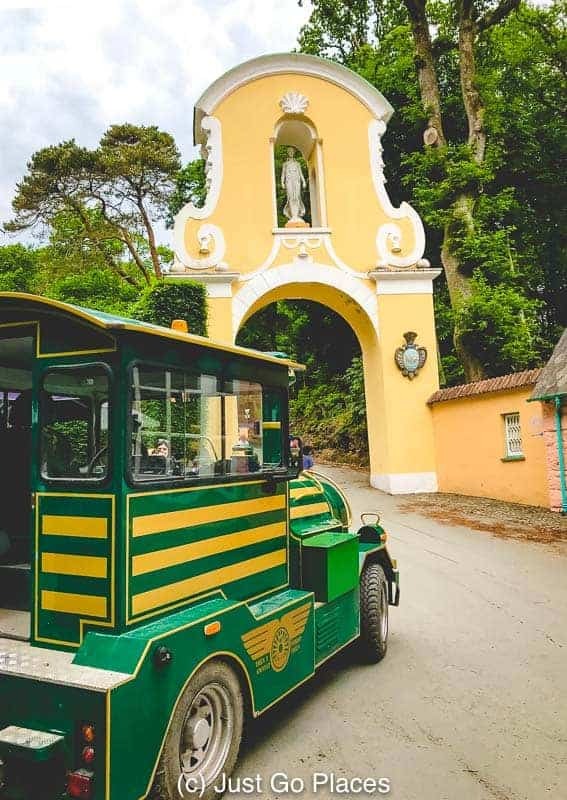 During the summer months a little Portmeirion train goes on a tour of the woodland. The sweet little Portmeirion train. 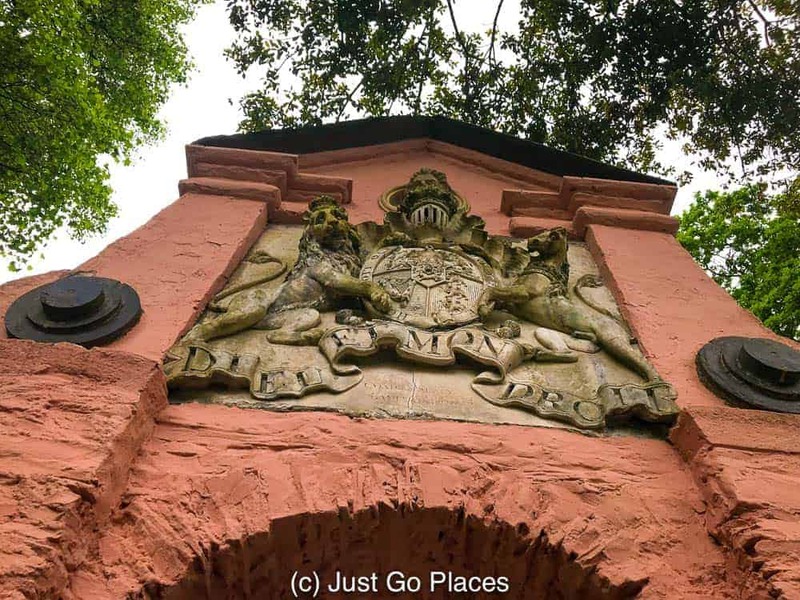 Explore Portmeirion in Wales on your own and there are charming little treasures hidden for you to find in its woodland, like a Dog Cemetery and a Chinese Lake with its little blue pagoda. Doesn’t this red bridge just pop amidst the woodland setting? Fun Fact! There are 70 varieties of Rhodoendron planted at Portmeirion North Wales! Set on a peninsula near Snowdonia National Park, Portmeirion in Wales is blessed with a good micro-climate. The Portmeirion Italianate village, however, still does not get as good weather as the Italian Riviera! The Chinese Lake at Portmeirion because Italian in Wales isn’t multicultural enough. There is a good array of options for eating and drinking at Portmeiron Italian village for both casual meals and fine dining. 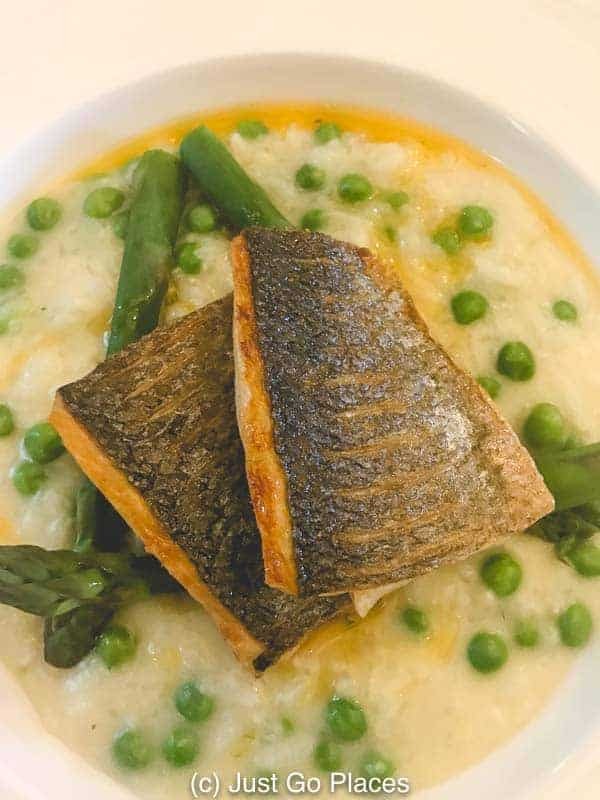 The Portmeirion Hotel restaurant is especially known for elegant meals. 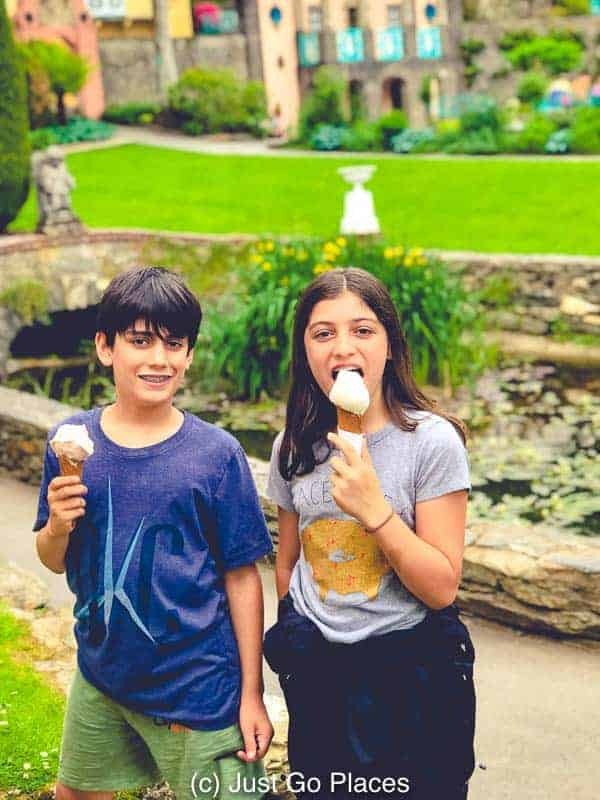 Kid-friendly options at Portmeirion restaurants include a pizzeria and gelateria. In Portmeirion North Wales, it’s gelato not the usual British Mr. Whippy soft serve ice cream. There’s a gorgeous white sandy beach that is created when the tide goes out at Dwyryd Estuary at Portmeirion Wales. It’s great for kids to have a play. High tide times are clearly marked so you do need to be careful. Down by the shore as well is the Amis Reunis a stone boat that children can clamber around. Portmeirion is famous for its pottery which was founded by Clough William-Ellis’ daughter, Susan. 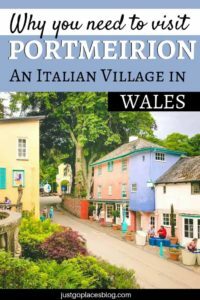 She set up Portmeirion Pottery in 1960 so that visitors to Portmeirion Italian village could purchase souvenirs of their visit. Pottery is a very English souvenir! 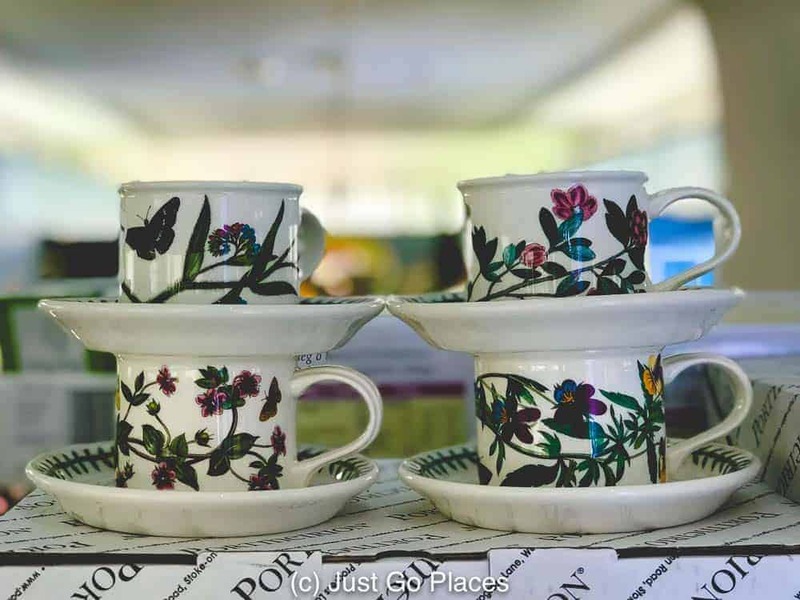 Charming botanicgarden teacups available at the Portmeirion outlet store. Portmeirion Botanic Garden is one of Portmeirion Pottery’s iconic ranges and based on 19th century English prints. Portmeirion Botanic Garden is one of the ranges available at the Seconds Shop, a Portmierion outlet store near the entrance. This Portmierion outlet also sells some of the newer ranges by British designers like Ted Baker and Sophie Conran. Fun Fact! Portmeirion Pottery is now based in Stoke-on-Trent, the home of British pottery. It now owns other big-name English potteries, such as Spode and Royal Worcester. 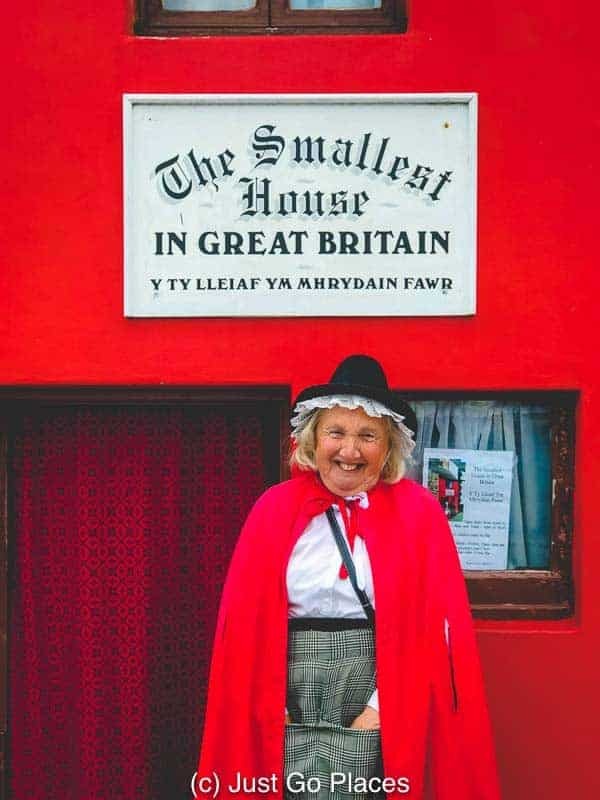 There are several small shops to visit including a small well-curated bookshop, a boutique, an art gallery, and a Welsh products store. You know Portmeirion Italian village is geared towards multi-generational visitors because there are lots of things a doting grandparent/aunt/uncle etc would buy for children. 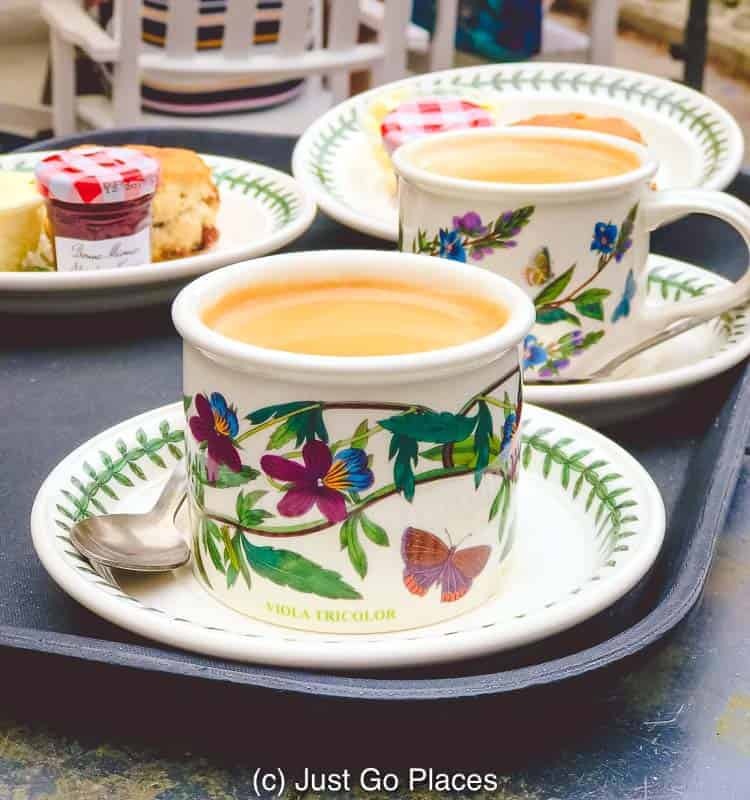 All the fresh air and exercise means you deserve a cup of tea (in Portmeirion Botanic Garden cups naturally) and a scone. The Mermaid Spa has a full-range of wellness facilities and vegan, all-natural treatment options. It’s location gives a divine view over the estauary below. A view of the estuary through the trees at Portmeirion in Wales. 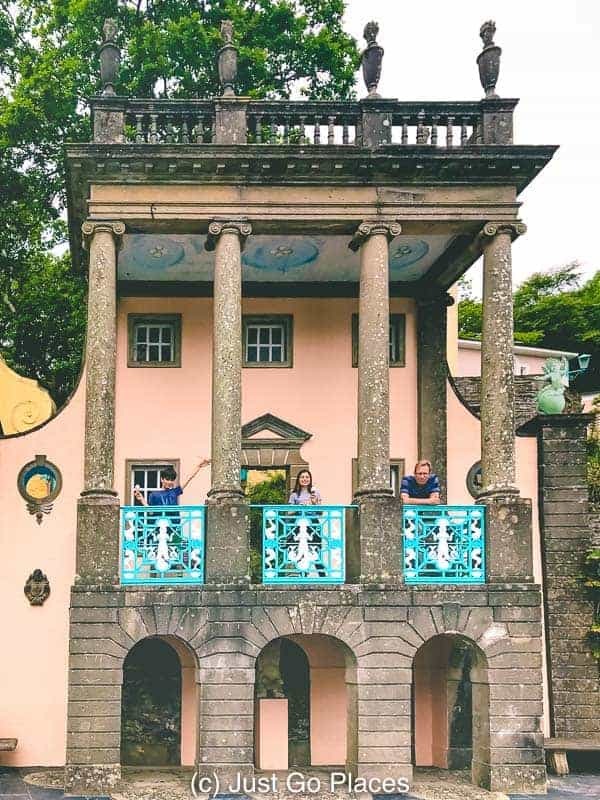 Every June, the Portmeirion Festival turns the Portmeirion Italianate village turns into a festival fantasy land with Festival No. 6. The name for the Portmeirion festival comes from the British cult TV show, The Prisoner, which was filmed in Portmeirion. 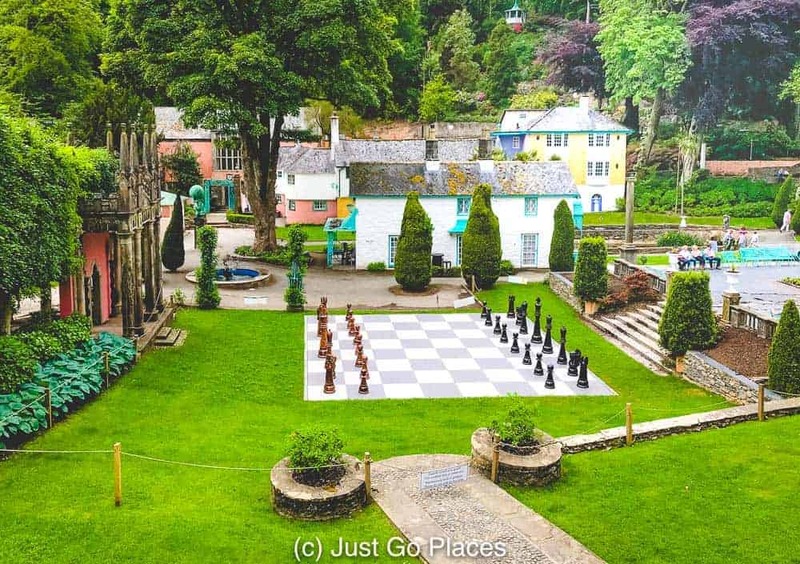 Human chess is played at the Portmeirion Festival in a nod to a scene from The Prisoner. 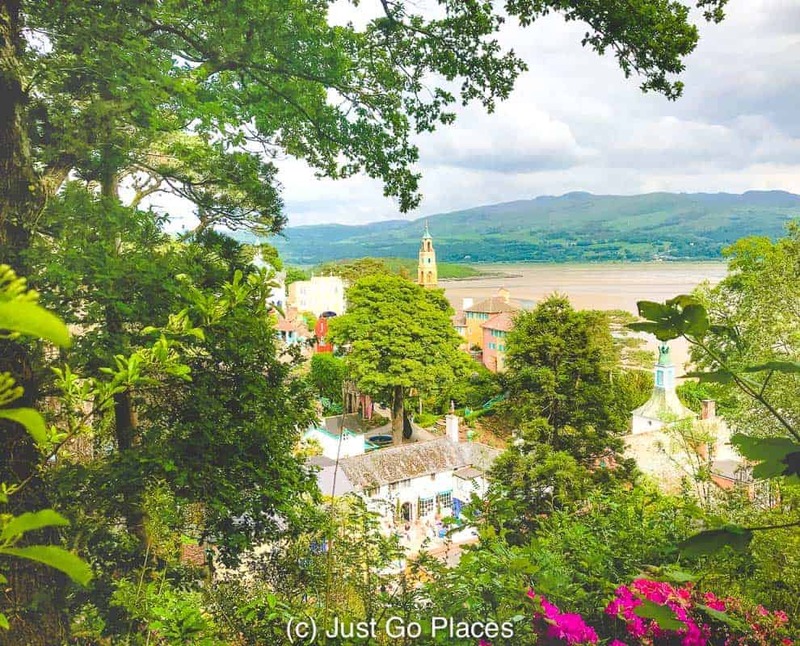 The Portmeirion festival has musical gigs, arts and cultural events, family-friendly activities, and even a street food village. Everything at the Portmierion festival isn’t all clean-cut health and well-being though – there’s a rave in the wood for your hard-core partiers. 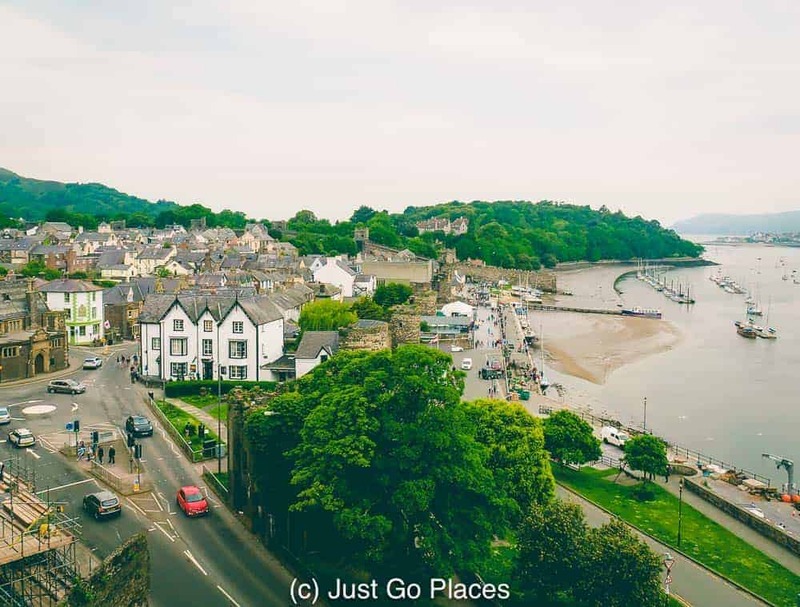 Portmeiron is a perfect place to stay since pretty much the entire village is either self-catering cottages or hotel rooms. Plenty of people visit Portmeirion for a day trip. If you stay in Portmeirion accommodation though you will have the run of the place long after the tourists are gone. The hotels all offer parking. You definitely need a car to appreciate this part of Wales. You have two choices for accommodation in Portmeirion. Both four-star hotels in Portmerion Wales have family-friendly accommodation available. The Portmeirion Hotel, is an adaptation of an old manor house. Portmeirion Hotel has a charming outdoor heated pool open in the summer months and a seaside location with a sandy beach by the main building. Hotel Portmeirion Wales is the brainchild of Clough William-Ellis himself. Check out the reviews for Portmeirion Hotel on TripAdvisor. The rooms are spread out amongst the Portmeirion Hotel main building, rooms in Portmeirion village itself and Portmeirion cottages to rent on the grounds. The Portmeirion Hotel Wales can accommodate families in some of its accommodation. For example, the Portmeirion holiday cottages can accommodate groupss that range from 3-9 guests. The Portmeirion hotel restaurant is the acknowledged fine dining establishment for the village with its Art Deco interior. The Portmeirion Castle, Castell Deudraeth, is the modern version of historical Portmeirion accommodation (if that makes sense!). 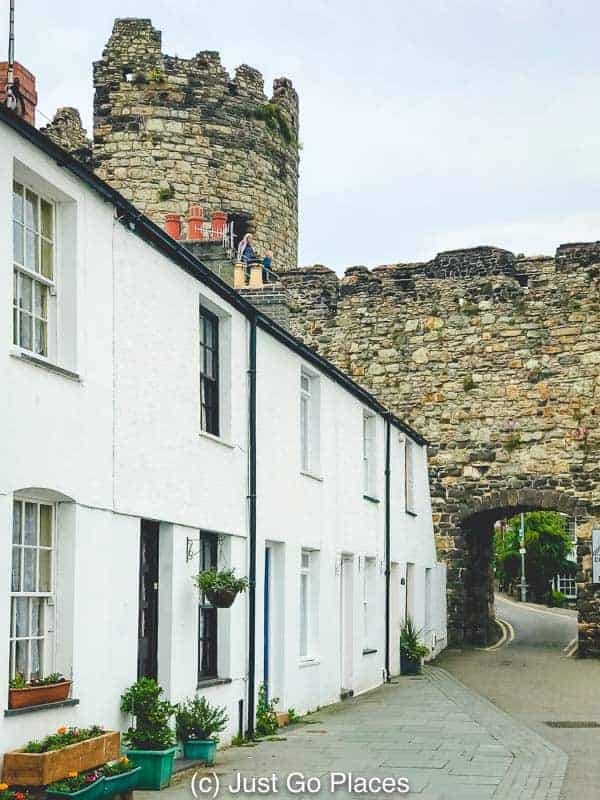 Castell Deudraeth Hotel is a Victorian folly that’s been converted to a contemporary-style hotel. The restaurant at Castle Deudraeth feels more like a gastro-pub and overlooks a beautiful little walled garden. Check out the reviews for the Portmeirion Castle Deudraeth Hotel on TripAdvisor. There’s a mini-bus that runs from the Portmeirion Castle and Hotel Portmeirion because the Portmeirion Castle is accommodation near Portmeirion but not in the village itself. 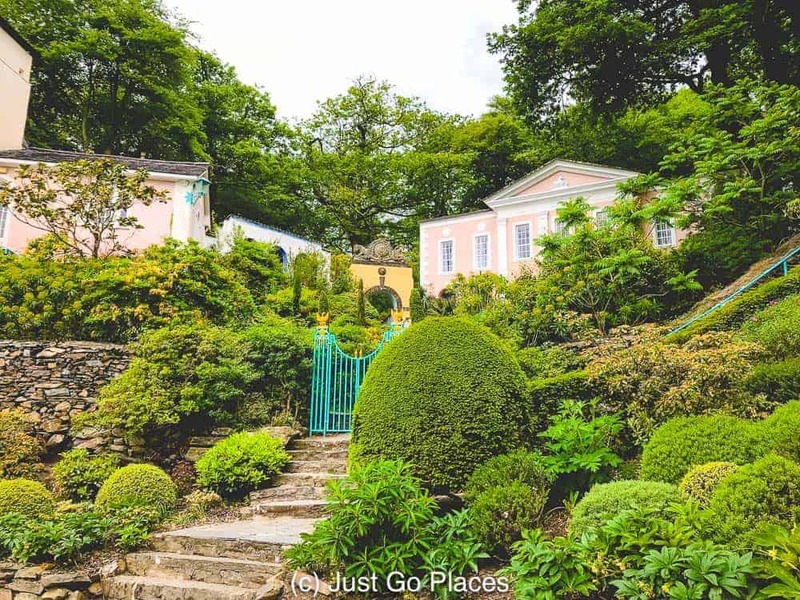 Thanks to the compact nature of Portmeirion Wales, you may need to find accommodation near Portmeirion if the Portmeirion hotel options are booked. 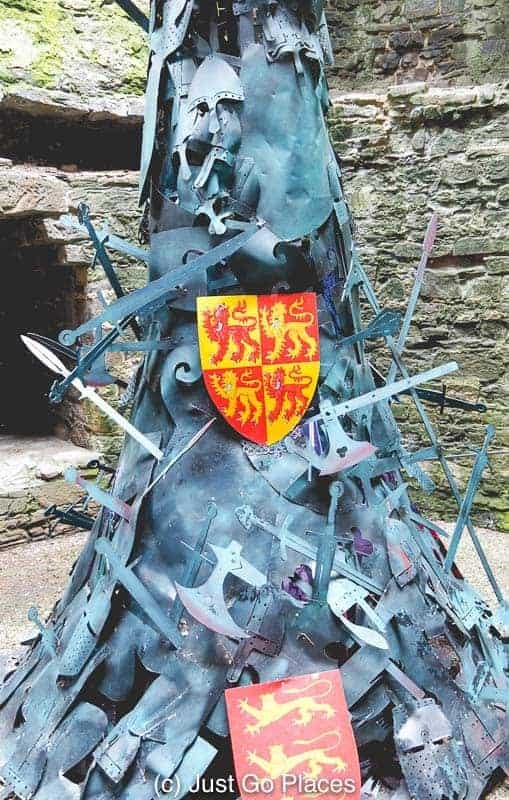 Royal Sportsman Hotel is located nearby in Porthmadog which is 2 miles away from Portmeirion Wales. 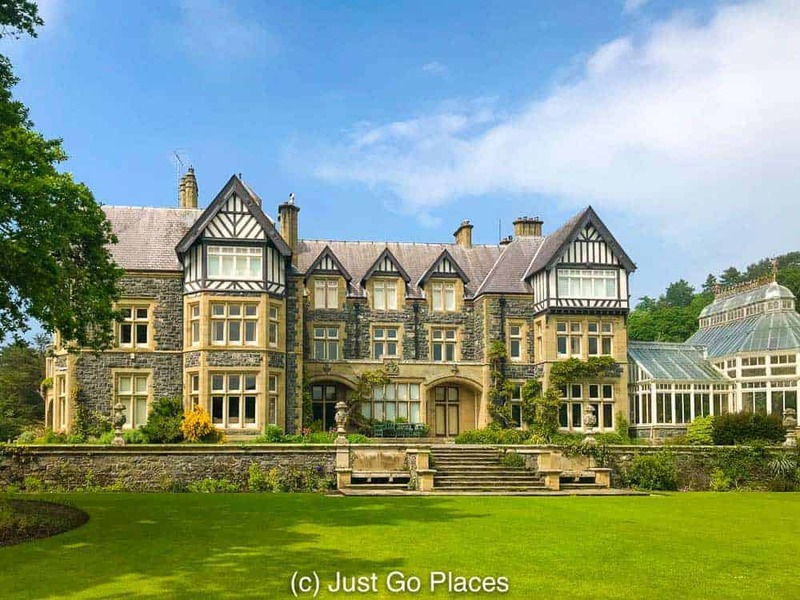 Rated a 3 star hotel, this accommodation near Portmeirion has 28 guest rooms. Check out the reviews for the Royal Sportsman Hotel on TripAdvisor. Tudor Lodge is a family run guesthouse in Porthmadog as well. They have a range of rooms from singles to doubles as well as a separate cottage. Check out the reviews for Tudor Lodge on TripAdvisor. Dina’s Camping, Glamping and Caravan Park is an option for you Portmeirion Festival goers who go the traditional festival camping route. Check out the reviews for Dina’s Camping, Glamping and Caravan Park on TripAdvisor. 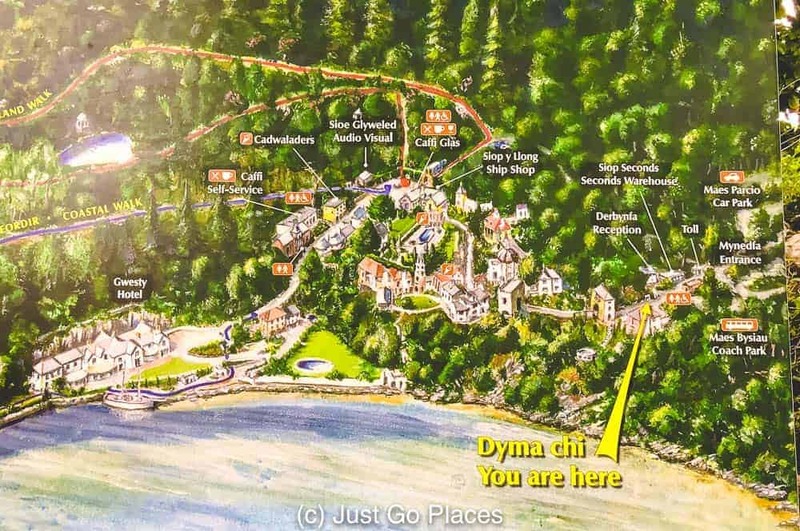 You can find Portmeirion camping sites courtesy of this map from the Camping and Caravanning club. Please note that there is no wild camping in Snowdonia National Park so stick to Portmeirion camping in legit places! Owned by a charity, the Portmeirion entry fee charged at the entrance goes towards its upkeep. Portmeirion Village is open daily for visitors. Exactly the architecture you’d expect from Portmeirion Italianate village. You can buy day tickets (currently the Portmeirion entry fee comes to £11 for adults with a concession for children). Children under 5 go free. There are also family tickets (including a very progressive single adult family ticket option). What is it about the English countryside? Why is the beauty so much more than visual? Why does it touch one so? This quote from one of my favourite books (and movies) expresses the more-ness that is the English countryside. Sure it’s pretty but there’s also centuries of history and tradition inextricably woven into the fabric of what you see. 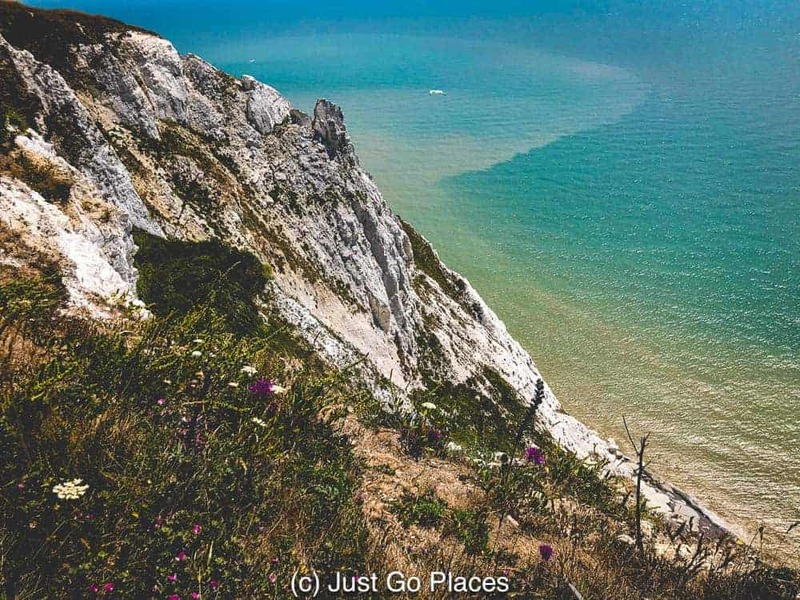 When we recently took a road trip to the Seven Sisters Cliffs from London with our Europcar rental car, we were struck again by how very long the landscape has existed and how very small we are in comparison. Beachy Head, The Seven Sisters Cliffs, Birling Gap – the entire South Coast has seen the arrival of William the Conqueror in 1066, the destruction of the Spanish Armada in 1588 and the non-invasion of Napoleon and Hitler. Events jump in spans of hundreds of years. The South Coast may be eroding slowly but it will outlast us all. Sunset over the Marine Parade sign in Eastbourne. As much as we love London, heading out into the English countryside is a real treat. There’s a lot to be said for fresh country air and wide open spaces. 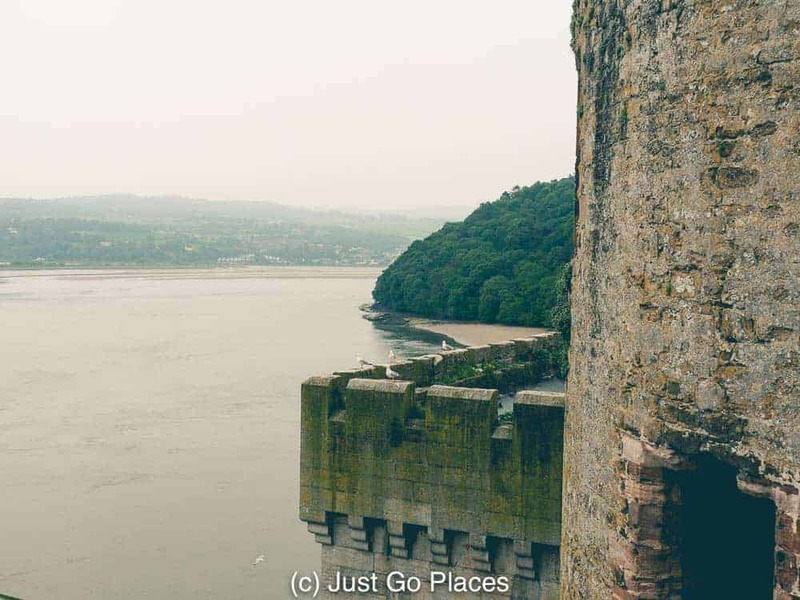 A lot of England is accessible by public transport, but we are definitely road trippers! It’s just a lot easier (and often cheaper) to have your own transport when you are travelling with children, too. You are on your own schedule and can make stops as you choose. We were invited to participate in Europcar’s long term car hire program. 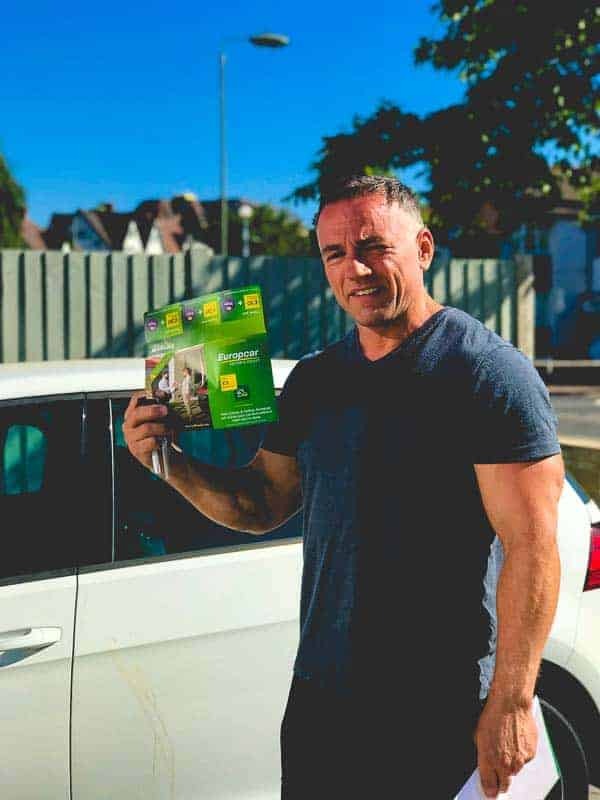 This program is super flexible and available at every Europcar in the UK. It lets you rent a car for 28+ days at more affordable rates than the usual rental but with more flexibility than owning/leasing. In addition, with one month’s notice you can switch out your car if your needs change. We had a Volkswagen Golf in London through the Europcar long term program which is a great city car. It’s the right size for running errands and squeezing into small parking spots. There are times though when a big car can come in useful. We traded in our Volkswagon Golf for a 7 seater Sharan. Europcar have a delivery and pick up program so the exchange was done in front of our house which was superconvenient. I’m so busy that I don’t know if I’d even get around to changing a car if it wasn’t so easy! A Europcar UK representative will deliver/pick up the car for free. 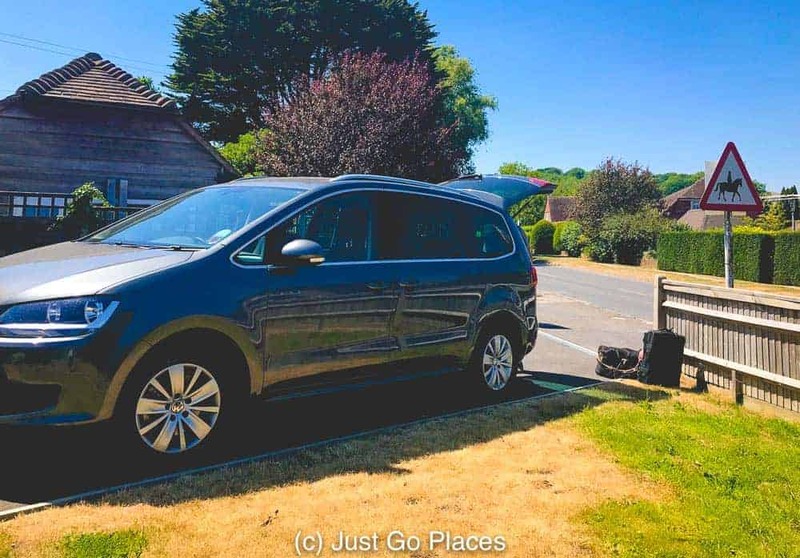 We used the Sharan for running some of our bigger errands in London (such as an Ikea trip! ), taking visiting friends to the RHS Hampton Court Flower Show and going on a road trip. We went on a long weekend away to the South Coast and the South Downs National Park. I’ve got a family of bikers so with the extra space we were able to throw our bikes in the back along with our luggage. As any veteran road tripper knows, getting somewhere is as much fun as the destination itself! One of the things we take for granted today as a summer ritual, the beach vacation, started only in Victorian times. The Victorian seaside holiday transformed towns such as Brighton and Eastbourne. 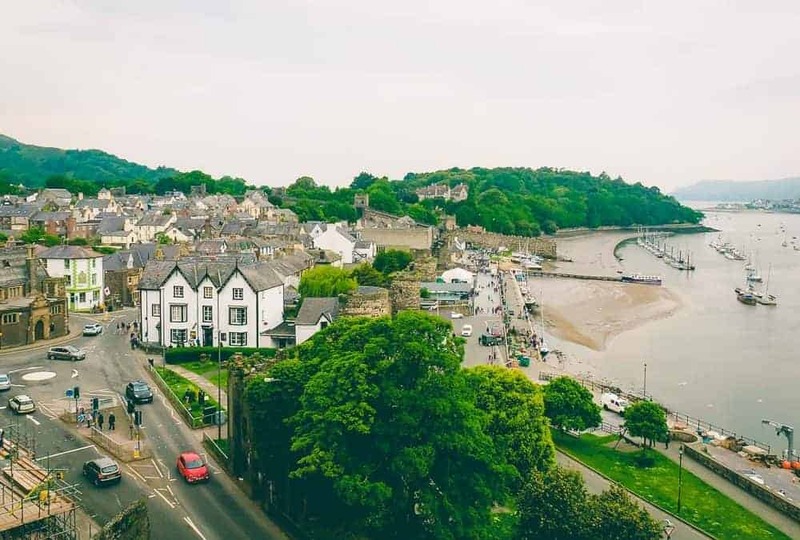 When the fashionable people decided it was healthier to visit the shoreline instead of taking the waters at a spa town like Bath, everyone else soon followed. Eastbourne has the unfair reputation for being a sedate town suited for an elderly population. This reputation was gently mocked in the hilarious coming-of-age book Angus, Thongs and Full-Frontal Snogging where 14 year old Georgia lives in Eastbourne and moans that nothing exciting ever happens to her. Fun Fact! 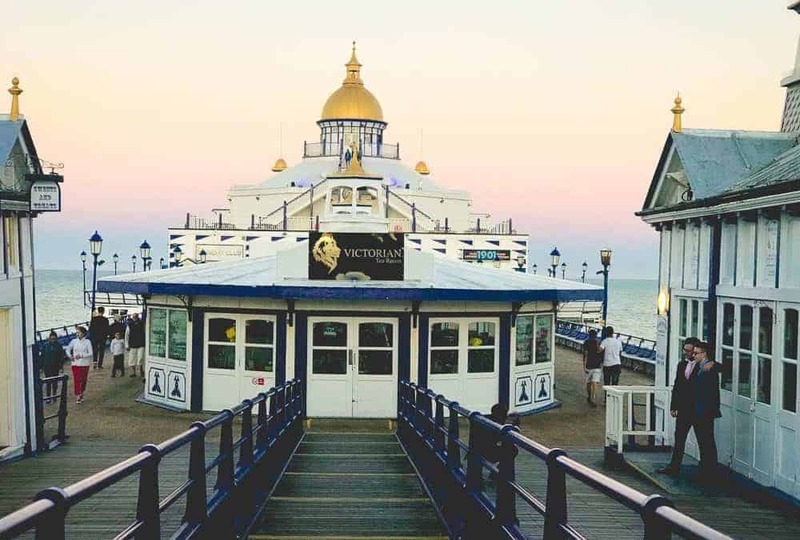 Filming for the movie, Angus, Thongs and Full-Frontal Snogging was done along the Eastbourne pier and seafront but the house the family lived in was actually located in nearby Brighton. Don’t trust conventional wisdom! There’s lots to do in this charming town for everyone. 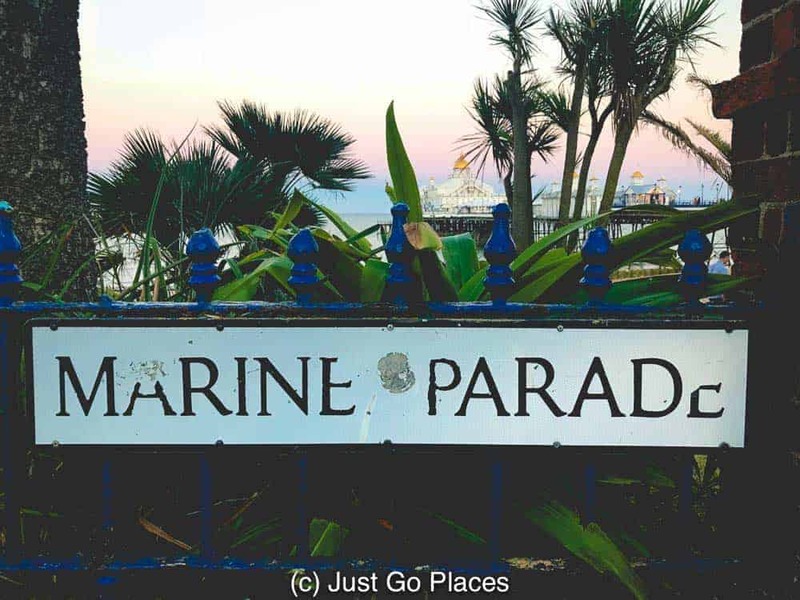 Marine Parade is a seafront road with lots of hotels and cafes. The buildings in this area were built between 1790 and 1840. 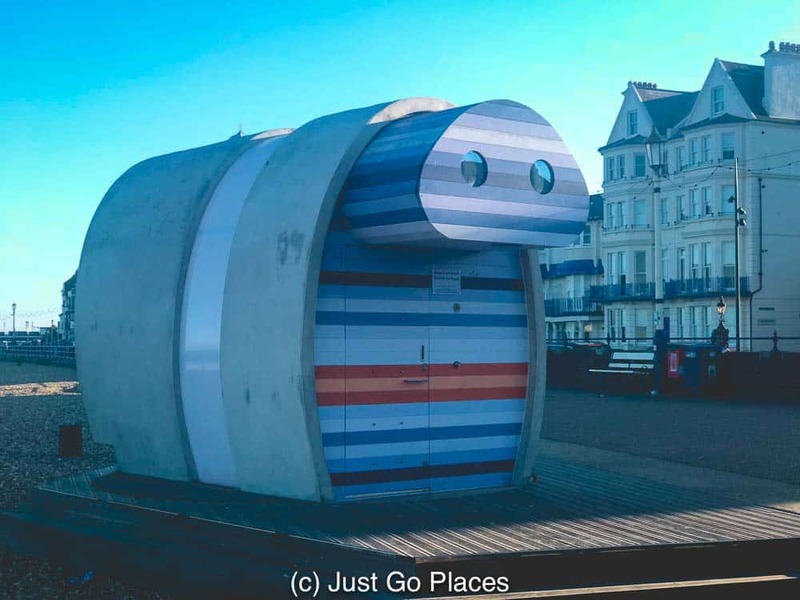 One of the hotels on Marine Parade had an old-fashioned Victorian bathing machine on display which my kids found fascinating. Victorian ladies would be wheeled down into the water in this machine by horses so that they could get into the sea with modesty intact. 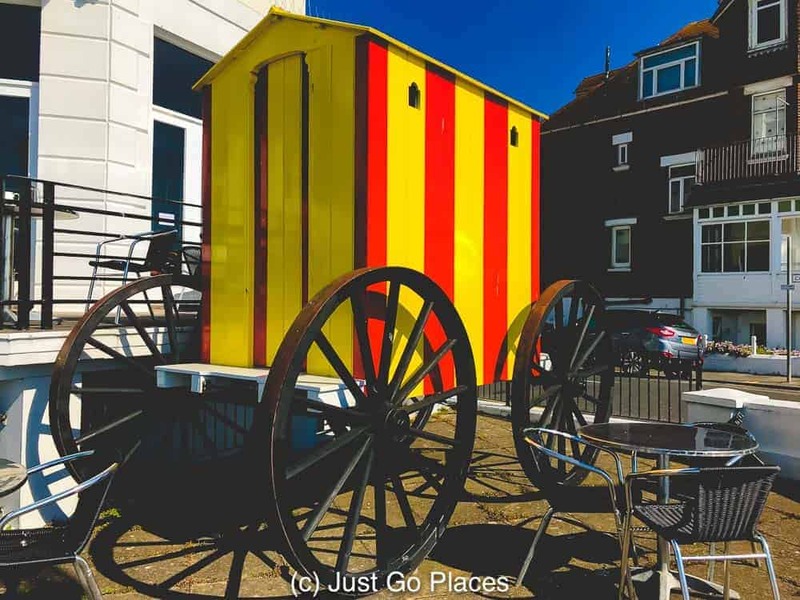 A restored Victorian beach wagon shows how ladies used to bathe in the sea. Eastbourne Pier has been blown away by storms, exploded by mines, and ravaged by fire but it’s still standing! The original opened in 1870 but what you see now is the latest 2015 incarnation. 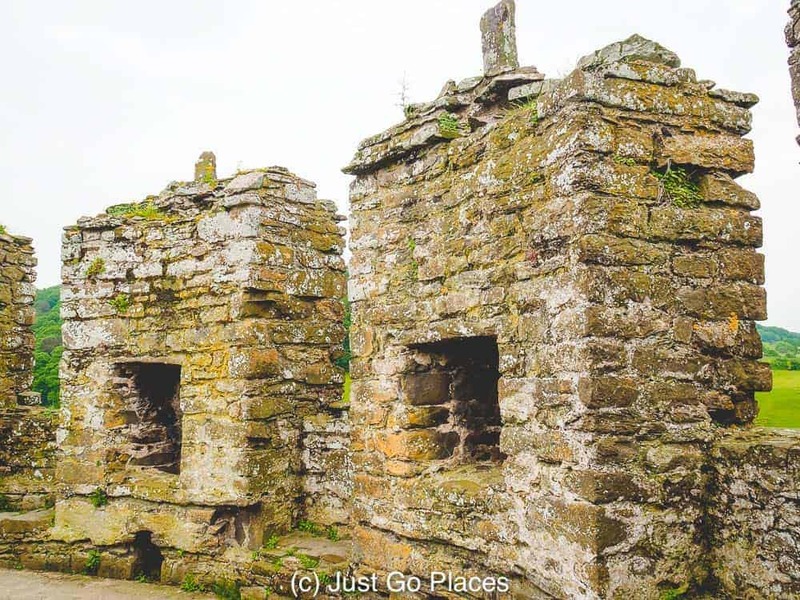 Some of the attractions include a fish and chips store (naturally! ), a Victorian tea room, a jazz lounge and assorted entertainment events. Eastbourne Pier in all of its ornate Victorian glory. The Eastbourne beaches are pebble beaches. There’s a wide swathe of beach right in front of Marine Parade so you don’t need to venture too far. On the other side of Eastbourne Pier there is also the Grand Parade beach. We saw the most charming contemporary little beach huts at Eastbourne Beach. Our favourite beach hut was on a revolving device so you could move the beach hut view to suit your needs. The exterior had an outdoor shower. The interior had a little kitchen, sitting area and lofted sleeping area. You can rent it for a very reasonable £45/day (£50 in July/August). A very non-traditional beach hut that you can rent. 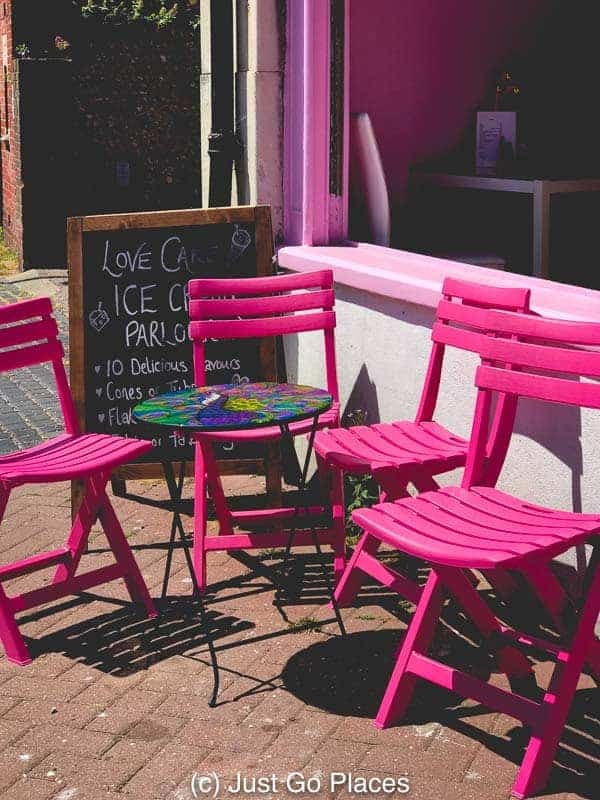 Little Chelsea is a trendy area in Eastbourne for eating and shopping conveniently located near the Eastbourne train station. Although not a very big area, it’s got a charming selection of delis, cafes and boutiques. My kids consider ice cream a main food group in the summer. The Eastbourne Redoubt was built in the early 19th century as part of the country’s defence against a possible invasion by Napoleon. By the time construction was finished though, the threat of an invasion had passed. During World War I, the redoubt was used by military police and during World War II, it was used for storage. 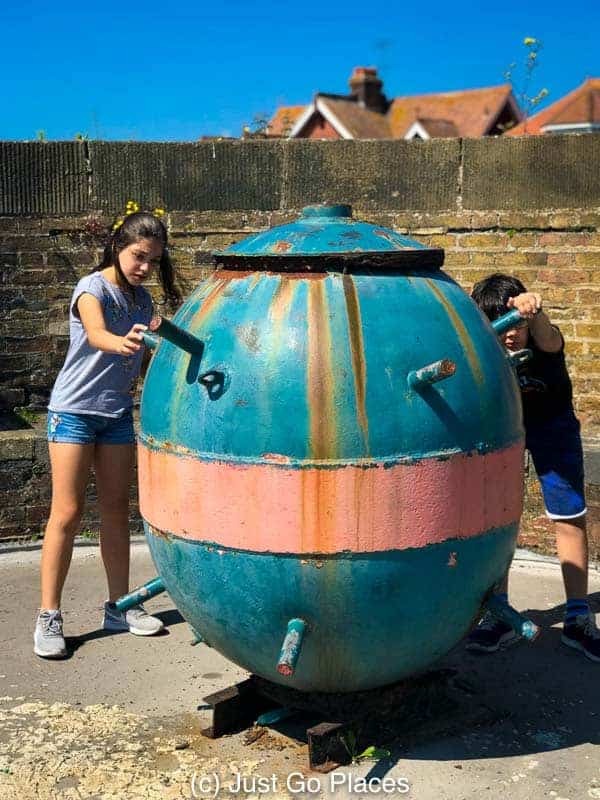 When they saw this unexploded mine at Eastbourne Redoubt, my kids couldn’t believe how big it was. Nowadays, the parade area and the top of the fortress are open to the public free of charge. There is a small military museum which does charge admission. The Eastbourne Open is held annually in June at the Devonshire Park Lawn Tennis Club near Eastbourne town center. The Eastbourne International usually gets a few big names and is the last grass court tournament before Wimbledon. 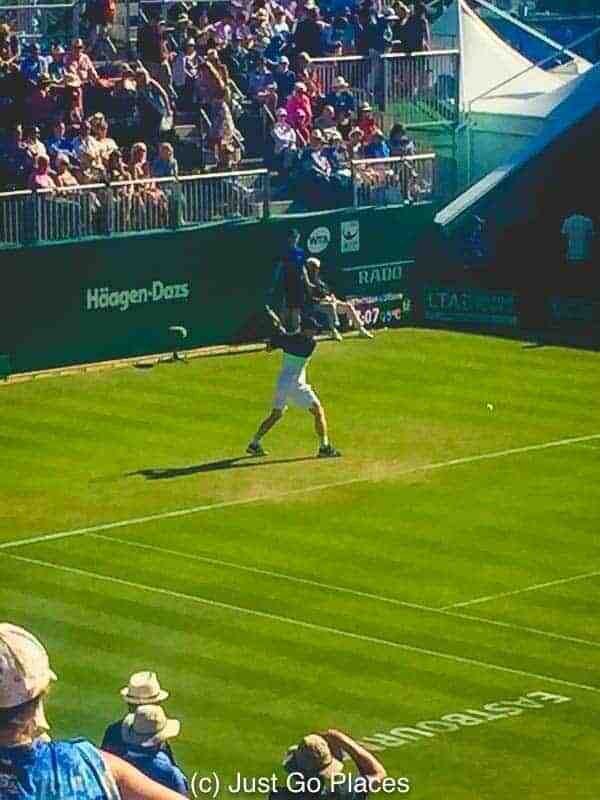 For example, this year Andy Murray played at Eastbourne as part of his comeback from injury. Sadly, Andy Murray did not fare well at the Eastbourne international tennis tournament. Every year in August, Airbourne is also the Eastbourne International Airshow. There’s free entry and a 2 mile display along the Eastbourne coast with big name RAF and international flying display squads such as the Red Arrows. 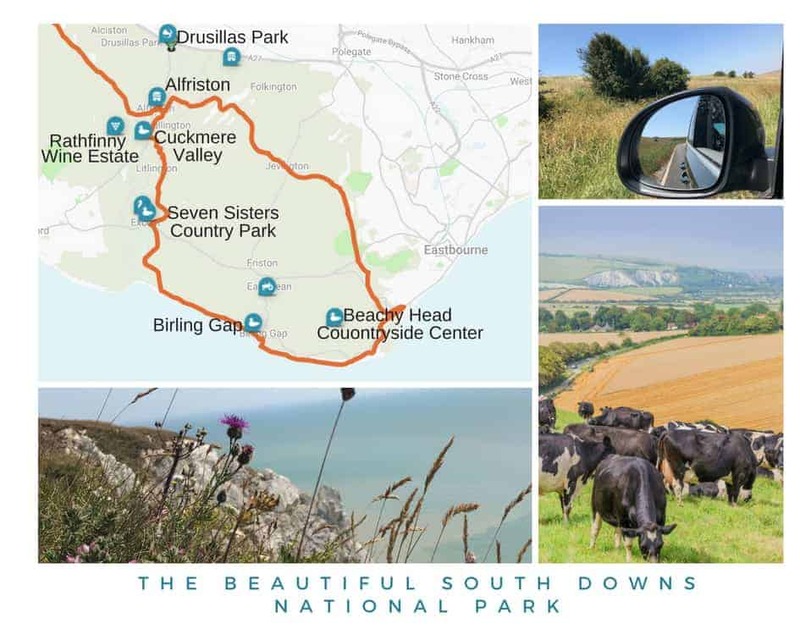 All of these places are in the South Downs National Park. 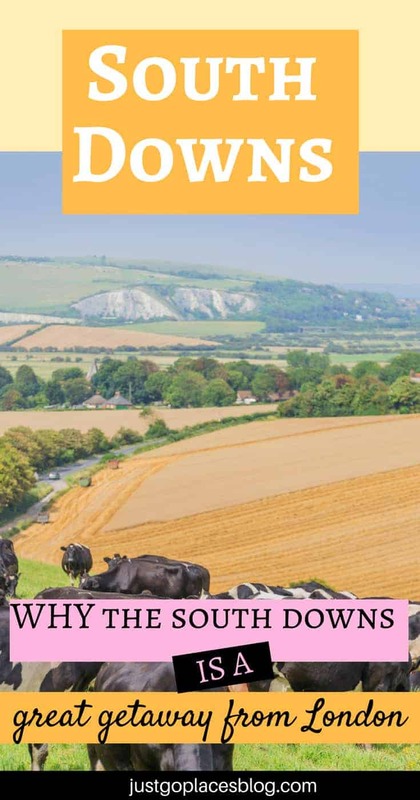 The South Downs National Park covers 3 counties in England and runs from the cities of Winchester to Eastbourne. The national park covers over 1600 square kilometres of area where over 110,000 people live. Over 85% of the South Downs is farmland. Beachy Head East Sussex is the UK’s highest white chalk sea cliffs (not the white cliffs of Dover!). It’s appeared in films (such as James Bond and Harry Potter) and on television commercials. In fact, the Beachy Head cliff is often a stand in for the Dover Cliffs because they are bigger and whiter. There are lots of beautiful coastal exploring to be done on Beachy Head walks. The Seven Sisters are chalk cliffs on the South Downs National Park that run from Eastbourne to Seaford. There are technically now 8 sisters because the erosion of one cliff has created another one. You get the best views of the Seven Sisters cliffs from Seaford Head. Fun Fact! Coastal erosion means that the Seven Sisters erode by an average of 0.4m annually and Birling Gap by 0.7m. The Seven Sisters Country Park is 280 hectares of cliffs, parkland and river valley. It’s great for walking and cycling. There’s a cafe behind the Visitor’s Center which is located across the road from the entrance to the country park. The Seven Sisters Cliffs have also been subject to coastal erosion. 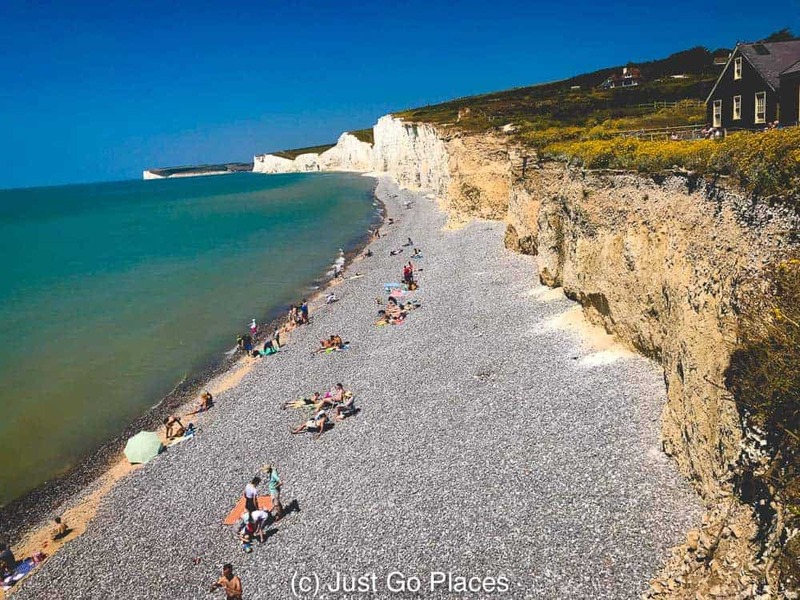 Run by the National Trust, Birling Gap is perfect for walking along the cliffs and for playing on the beach. You get to the beach by a staircase from the cliff. Kids will enjoy fossil hunting (remember the Jurassic Coast is a bit further West along the English Channel) and exploring the rock pools that form when the tide goes out. Coastal erosion has caused the breach at Birling Gap. 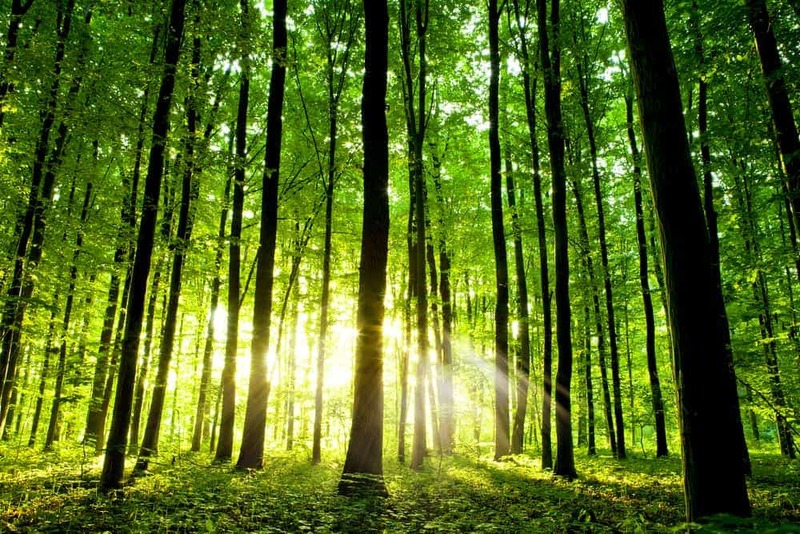 Friston Forest is perfect for walkers and for cyclists. The two walking trails are easy to do with children and not very long (between 1- 1.5 miles). The mountain biking is more challenging but there is an easier family route you can take. Friston Forest is a woodland gem to explore. Alfriston is a village in the Cuckmere Valley which is pretty as a picture. In fact, it was included in The Telegraph Travel’s list of England’s prettiest villages. Alfriston may be a small village but in true English style, has several pubs. In front of the George Inn, there is a masthead from one of the ships of the Spanish Armada that locals salvaged. The town is also the site of the very first National Trust property ever purchased, a 14th century thatched clergy house. Fun Fact! 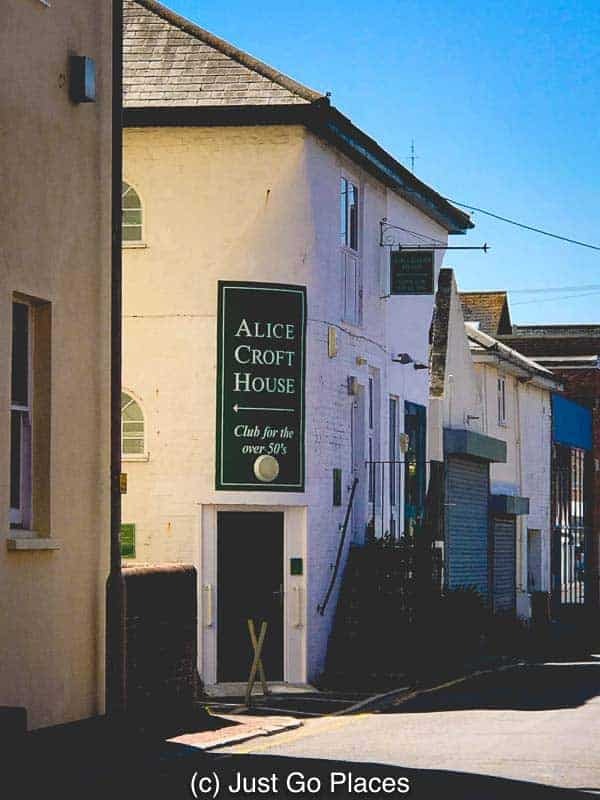 The hymn “Morning Has Broken” was written in Alfriston about the village in 1931 and reached worldwide fame in the 1970’s when sung by Cat Stevens. 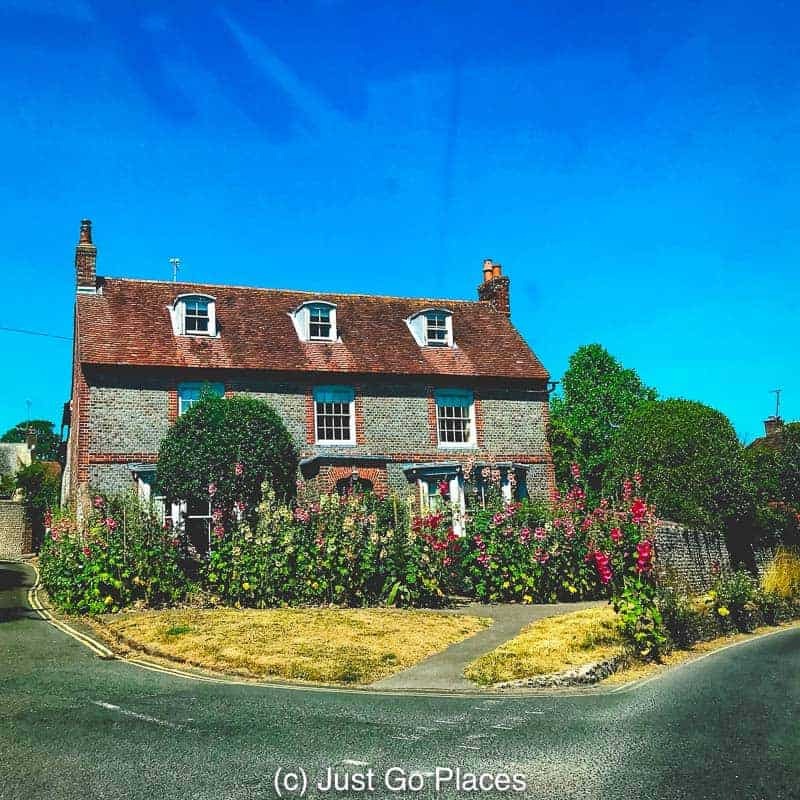 This house in Alfriston is almost impossibly pretty. Drusilla’s Zoo is a theme park for young children near the village of Alfriston East Sussex which is perfect for young children. There is a zoo with lots of interactive exhibits as well as animal exhibits that kids will enjoy – penguins, meerkats, butterflies, snakes etc. In addition, there is a large play area where kids can run around and let off steam. A dedicated Hello Kitty area will delight all fans of this cute Japanese export. 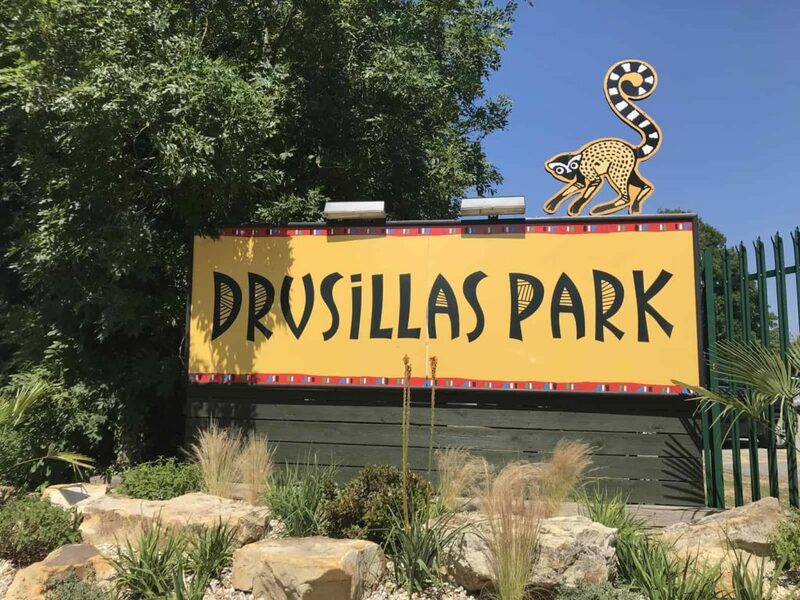 Drusilla’s Park is perfectly sized and themed for young children. It reminds me of Sesame Place in the USA but more educational and with less water. You can easily spend an entire day here and leave with happy, tired children. You are reminded that you are in 1066 country at Pevensey Castle. Pevensey was where William the Conqueror landed in 1066 changing the course of English history forever. We are talking 1600 years of history here! 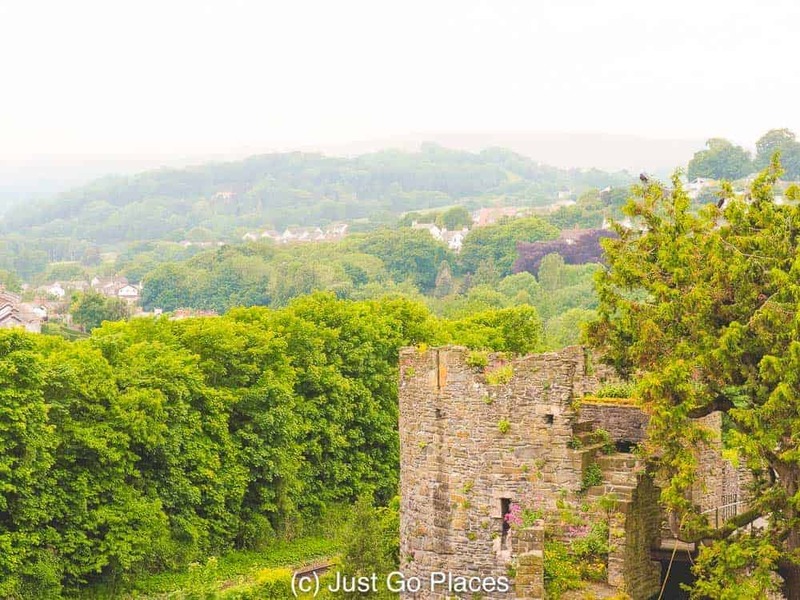 Although in ruins, the Castle is still majestic and is run by English Heritage. 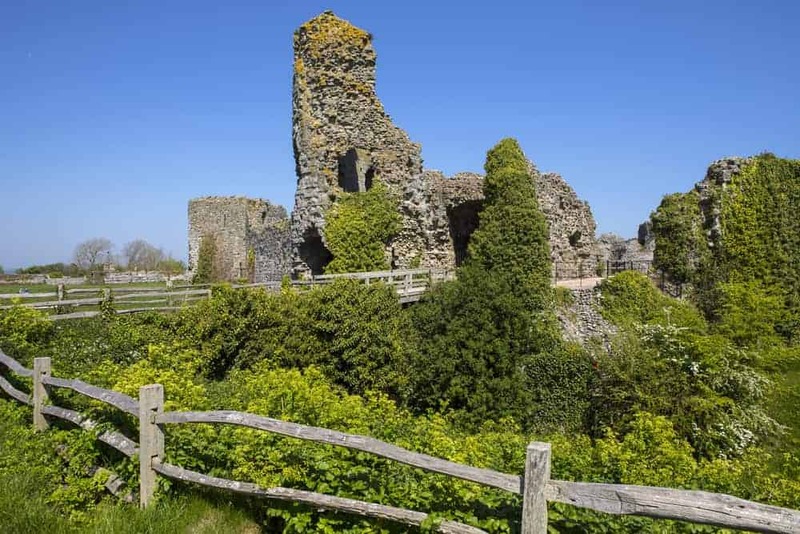 The ruins of Pevensey Castle have seen a mind-boggling 1600 years of history! Be aware that accommodation in Eastbourne and the surrounding area does fill up quickly because it is a popular domestic vacation spot. You can stay in pretty little Belle Tout Lighthouse which is a bed & breakfast near Beachy Head where the rooms have stunning views. There is a minimum 2 night stay. The best hotel to stay in Eastbourne is the 5 star Grand Hotel. 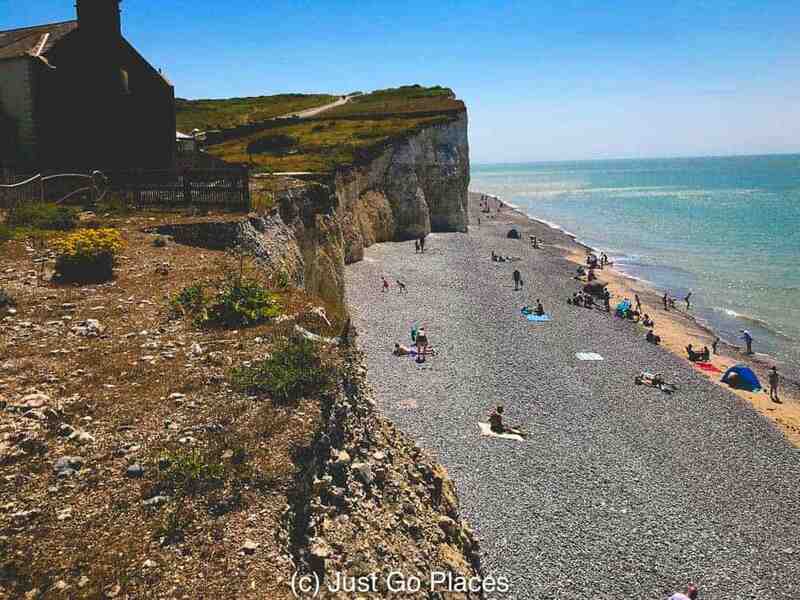 It’s located on the side of Eastbourne that’s closest to Beachy Head and near the popular dining and shopping area of The Meads. The Grand Hotel was full and so we stayed at York House, Best Western. Our room was huge even with a Queen bed, a single bed and a sofa bed. We had a room overlooking the sea and fell asleep to the sound of the waves crashing on the shore. The Crown and Anchor is a pub on Marine Parade which not only serves food but also offers live music on the weekends. Fusciardi Ice Cream Parlour on Marine Parade serves more than delicious ice cream. You can get breakfast there as well as simple dinners like jacket potatoes and sandwiches. Italian food seems to be a winner in Eastbourne. There’s also La Locanda del Duca for a fancy Italian meal and its more casual sister restaurant, Pomodoro e Mozzarella. Cuckmere Inn has good views of the Seven Sisters Country Park and also offers outside seating. 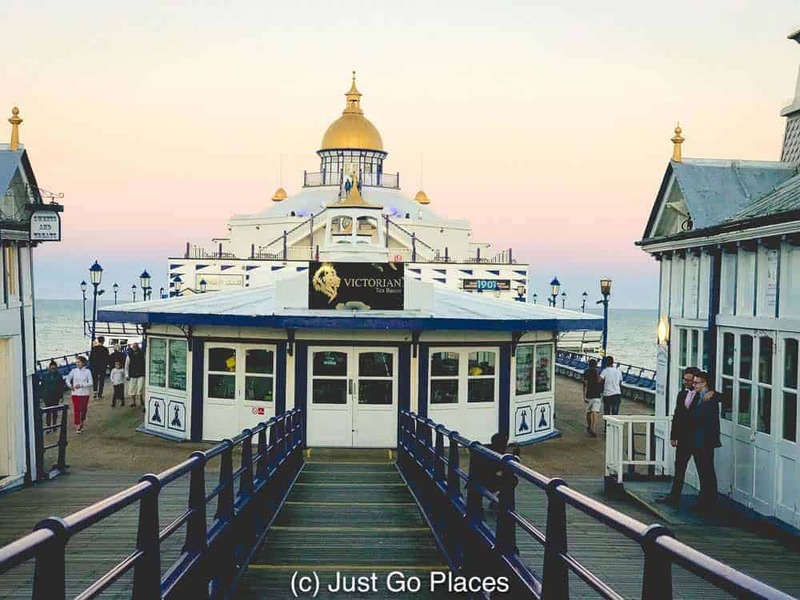 You can drive to Eastbourne and its environs from London relatively easily. From the M25 ring road, take the M23 which becomes the A23. At Brighton take the A27 which goes all the way to Eastbourne. Although Eastbourne has a train station, you definitely need a car to visit the South Downs easily. This post was written in partnership with Europcar. This site generates income via partnerships with carefully-curated travel and lifestyle brands and/or purchases made through links to them at no extra cost to you. More information may be found on our Disclosure Policy. Can you imagine swimming in rain water that fell 10,000 years ago? The mind boggles. Yet, that is precisely what you are doing when you visit the Thermae Spa Bath in the UK. 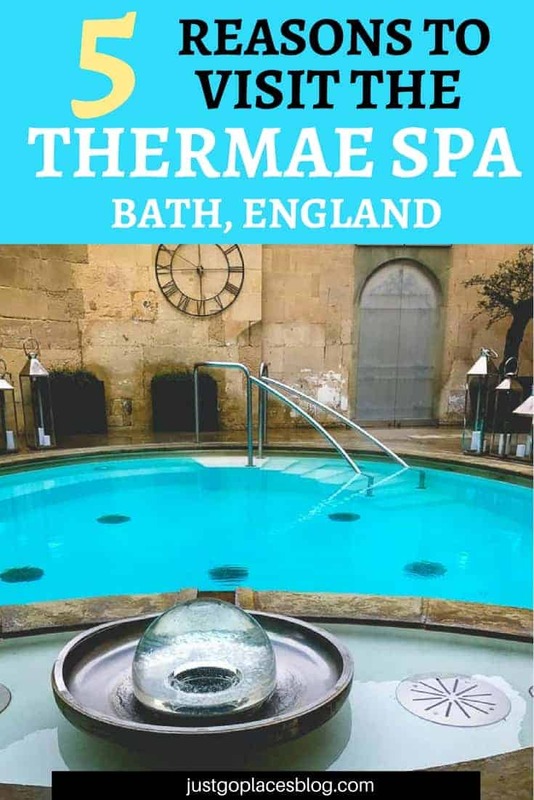 I am a big fan of spas and my children have visited thermal spas in Iceland, Japan and Austria, so a visit to the Thermae Spa Bath is right up our alley! The Thermae Bath Spa UK is located in the city of Bath in England. 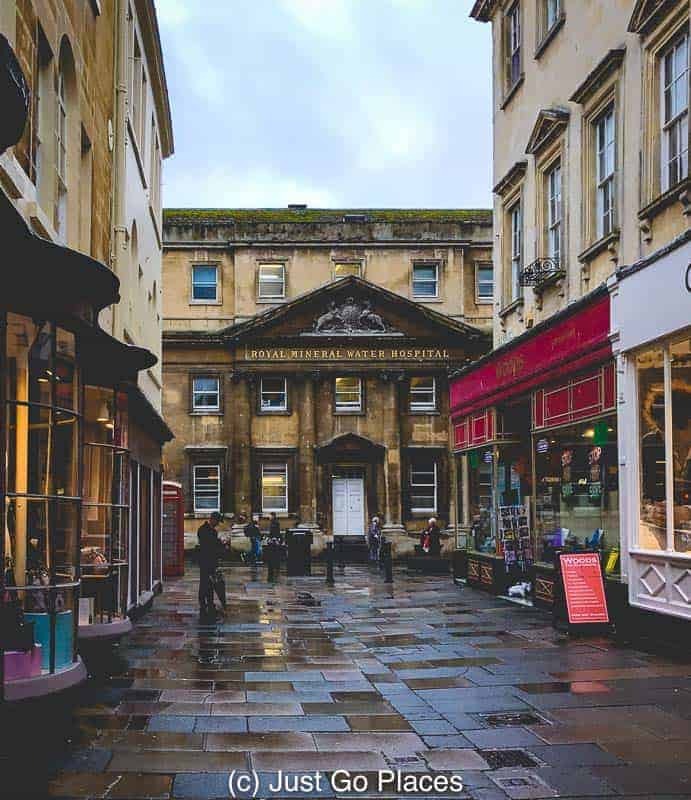 Bath is a beautiful UNESCO world heritage listed location marked by beautiful architecture and renowned through history for the thermal baths that gave the city its name. 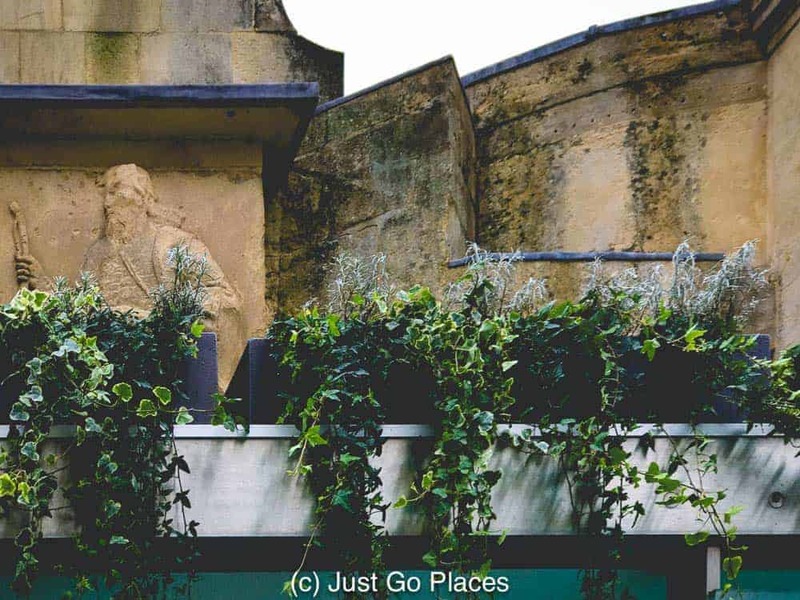 Located in the historic center of Bath right near its other main attractions, taking a dip in the thermal baths like the Romans did is partaking in a bit of history. Unlike the Georgians though, we don’t recommend you drink the water! The historic Roman Baths which you can tour. Then head nearby and try out the hot springs for yourself at Thermae Spa. 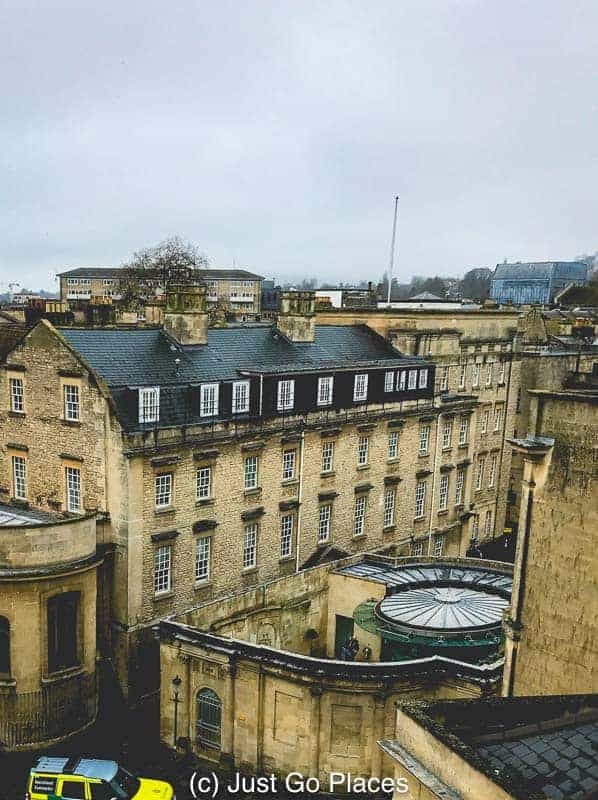 Why a Spa Day in Bath? Bath is one of the great European spa cities like Baden Baden in Germany and Montecatini Terme in Italy. You will be participating in something that has happened at this site since before even the Romans came to Britain! It really is at the same water as the historic Bath Roman baths spa nearby. Bath got its UNESCO world heritage listing thanks to its famous bath waters and the Georgian buildings created to enjoy them. You get to have a nice relaxing time AND partake in history at the Thermae Bath Spa UK. How many places can you do that?? Your body will feel rejuvenated and muscles that you didn’t even know were aching will feel better. Where’s The Water Come From? Geothermal activity created three springs that came to the surface in Bath. The springs bring forth rain water that fell thousands of years ago and then sank to a couple of kilometres below the Earth’s surface. No one actually knows the exact location of the source of the springs. The Thermae Bath spa is a tradition that goes back over 2000 years. It’s a city that grew in fits and starts with the periods of history jumping jerkily over hundreds of years as if the intervening years were the blink of an eye. Coming from a country like the USA which is only a few hundred years old, it’s amazing to think about this time line. First lets start with the founding legend of the city of Bath. There was Prince Biadud, the son of the King of the Britons sometime in the 9th century BC. He came down with leprosy and got cast out of the kingdom. So he works as a swineherd until he has a Eureka moment. He sees his pigs get cured of scabies when they roll around the mud of the hot springs in Bath. He decides to wallow in mud himself and gets cured. Returning leprosy-free to his father, he eventually becomes the 9th King of the Britons and goes on to father Kin g Lear (he of Shakespeare fame). Prince Bladud ’s so happy he creates the city of Bath. We saw a statue of Prince Biadud at Cross Bath Spa who was fittingly watching over the bathers. Fast foward to the Romans who did love their hot baths. 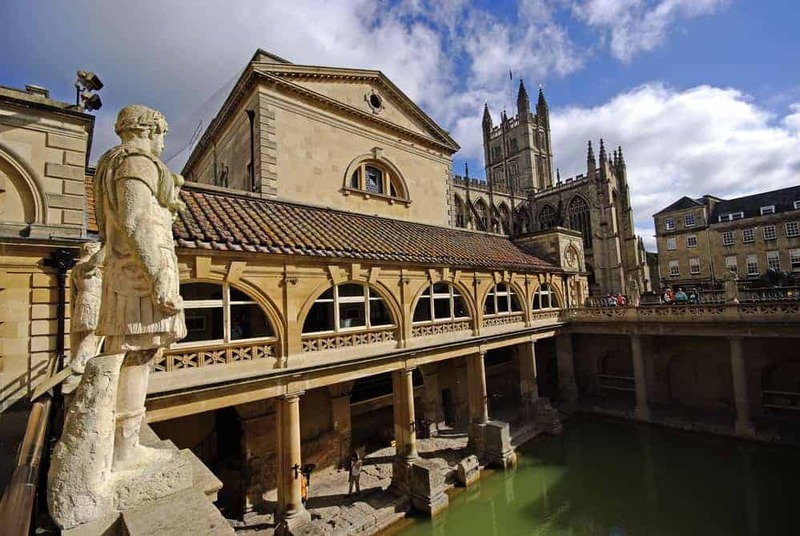 In 70 AD, the Romans created the baths and a temple to Minerva at Bath. The Romans leave Britain in 410 AD and the Saxons take over. There’s a few hundred years of decline in Bath’s fortunes until Edgar is crowned as King of England in 973AD at Bath Cathedral. Sadly that did not mean Bath’s fortunes rose again anytime soon though. In the mid-16th century a Dr. Turner wrote about the medicinal benefits of bathing in Bath. Intrigued, Queen Elizabeth I visited in 1574, and was pleased enough to make Bath an official city. Assorted royals and their courtiers visited the city over the next 100 years, including the openly Catholic Mary of Modena. Mary (married to the equally Catholic James II) couldn’t have a child but became miraculously pregnant after visiting the baths at Bath. Unfortunately, that child sparked the Glorious Revolution because the English did not want another Catholic king. The royal family got sent off to France and the English put James II’s more acceptable Protestant daughter Mary (and her husband William) on the throne. Wow! Bath’s thermal waters were indirectly responsible for regime change in Britain! Back in Bath, the Royal Family still favoured the city. Along with the royals came the aristocracy for spa breaks in Bath. The 18th and early 19th centuries saw the heyday of Bath and its baths. Jane Austen and her family came to Bath and catapulted the city into literary history. There is evidence that Jane Austen’s father and brothers bathed in the same Cross Spa where we bathed! How cool is that?? Bath fell out of favour in the late 19th century when the British discovered their love of the great seaside resorts like Brighton and the Isle of Wight. Although the baths at Bath had lost their luster, too, they were used as a rehabilitation centre by the UK military and the NHS. In 1978, the spa was closed because it was in such bad shape. After a multi-million dollar renovation, the Thermae Bath Spa UK was opened in its present form in 2006. The facade of the building may be Grade 1 listed but everything inside is state of the art and modern. The building is a masterclass in how old and new architecture can work together. It is constructed to be 6 stories in the back although you wouldn’t know it from the front facade which is a 4 story town house and shop premises. There is an indoor Minerva Bath which is the largest the pools. It’s got massage jets, whirlpool and even a lazy river! Available for your use at both pools are blue swim noodles so you really don’t even need to make an effort to even float. That’s my kind of lazy. The open-air rooftop pool offers divine views over Bath city and you can even get a peek at the Cross Bath nearby. An aerial view of the Cross Bath Spa (to the right of the photo) as seen from the Royal Spa. The thermal water contains over 40 different types of minerals. The four baths at the Thermae maintain a water temperature of 33.5 degrees Centigrade (92 degrees Fahrenheit). Nice and toasty even for the rooftop pool! 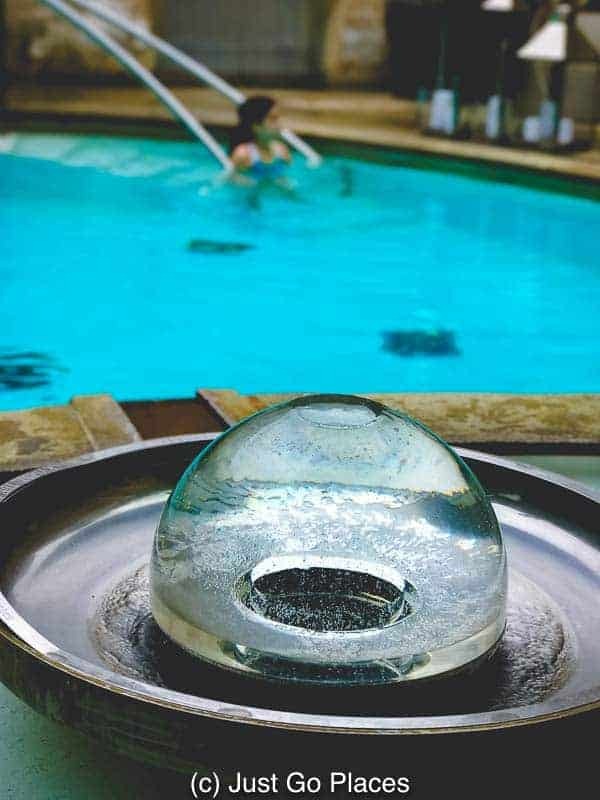 Fun Fact – The word spa coms from the latin “salus per aquam” which translates as health through water. Now go impress your friends with this random piece of trivia! There are 26 treatment rooms offering ever over 40 different types of therapies. For example, you can have a Vichy shower where you lay on a table and shower jets are sprayed over you to enhance circulation and treatment benefits. I had a Vichy shower at Terranea Spa in Los Angeles and it feels wonderful! It is a specialist treatment and not many places have the facilities for a Vichy shower. Other specialist treatments include Watsu Massage (a form of water massage) and Hot Stones Spa Therapy (where warm volcanic stones are used at pressure points to encourage relaxationf). There are also the usual massages. body wraps and facials. At its busiest, such for example the weekends, the Thermae Spa Bath gets over 1000 a people a day. On average though, you get about 700 people a day. During the quieter weekdays, you get about 400-500 people. Tip – It is advisable to book well in advance if you want a treatment during weekends. Check out the great reviews for Thermae Bath spa on Tripadvisor! On site at the Thermae Spa Bath, there is a Visitor’s center, a restaurant as well as two boutiques. Everything you could want for a relaxing few hours in this historic city. The Cross Baths Bath is also located in a Grade I listed building. Across the street from the Thermae Spa, the Cross Bath Spa can hold a maximum of 10 people. It can be rented for private parties, proposals etc. The Cross Bath Spa is located within a grand Grade I listed building. The Cross Baths Spa has its own changing rooms and bathroom facilities. You can even arrange for the Thermae Spa to send over a basket of food and drinks if you wish to eat while you are at the spa. The Cross Spring actually bubbles into the Cross Bath Spa through a stainless steel fountain sculpture by William Bye inscribed with words by former poet laureate, Ted Hughes. The spring water bubbles to the surface and then cleverly gets siphoned off and is gently treated before it enters the Cross Bath spa. We can attest that it is entirely relaxing floating on a noodle or two as you listen to the seagulls fly overhead, surrounded by the mellow cream stonework of the city. My daughter and I were at the Cross Bath Spa with another 3 families. Three of the 10 people would have fit the 12-16 age bracket. I was surprised though to learn that everyone there was from different parts of England. 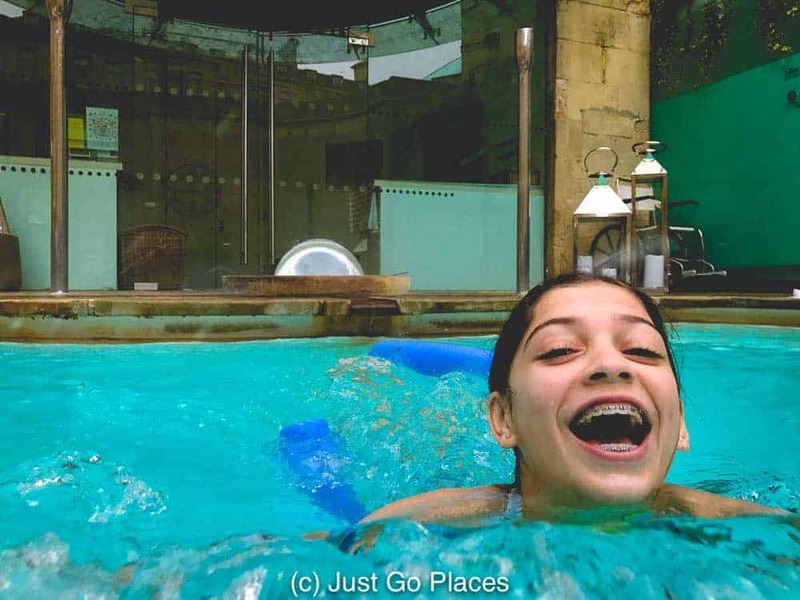 Most were visiting Bath but one mother/daughter duo were specifically on a spa break in Bath. Where were the international tourists visiting for a spa day in Bath?! What a hidden gem in Bath that they are missing! 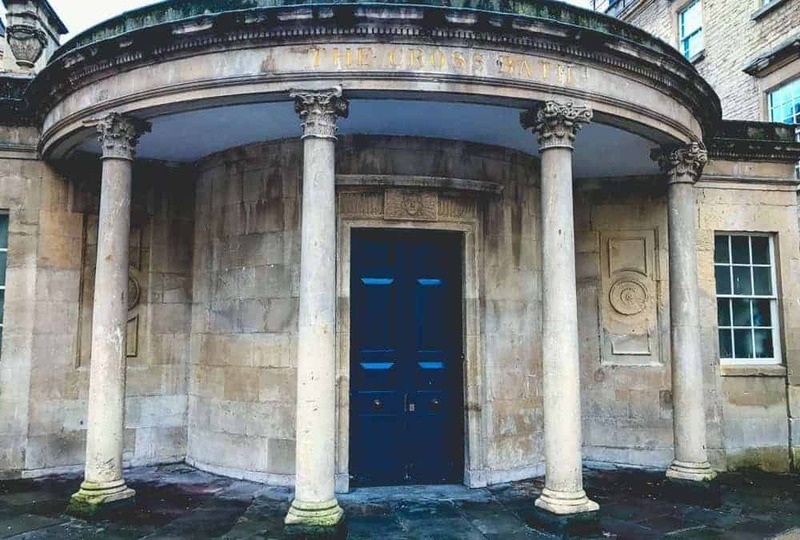 The Thermae is run by the same people who run the The Gainsborough Bath Spa – Bath” target=”_blank” rel=”nofollow noopener”>Gainsborough Bath Spa, a 5 star spa hotel opened in 2015. A member of the Leading Hotels of the World, the Gainsborough Bath Spa has excellent reviews on TripAdvisor. It is a great choice for a Thermae Bath Spa hotel if you want the whole spa package appearance. We chose to stay at the four star Francis Hotel also conveniently located in the historic center of Bath. It is a charming hotel and very convenienly located. 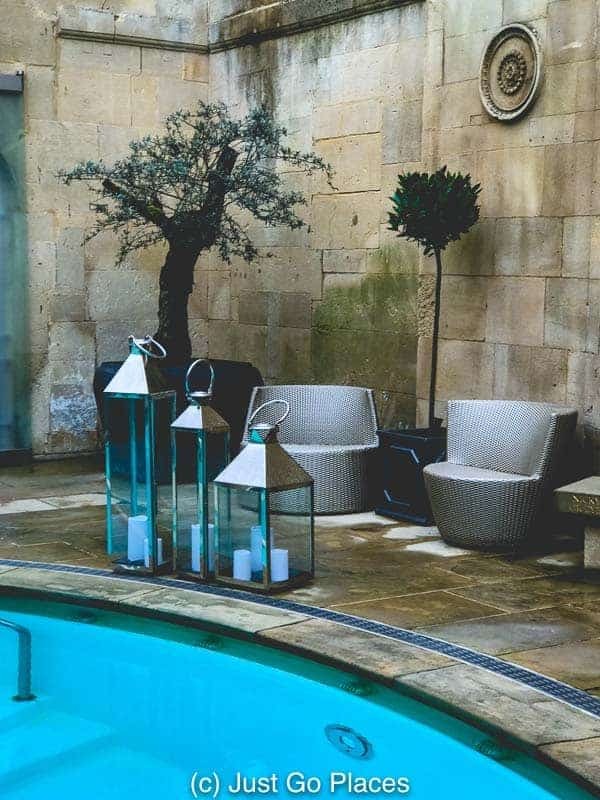 On previous trips to Bath, we have stayed at the No.15 Great Pulteney – Bath” target=”_blank” rel=”nofollow noopener”>No 15 Great Pulteney, a 4 star boutique hotel which is in walking distance from the Thermae Bath but over the river that runs through the city. You don’t need to make reservations to visit the Thermae Bath Spa but you do need to make reservations for specific treatments. 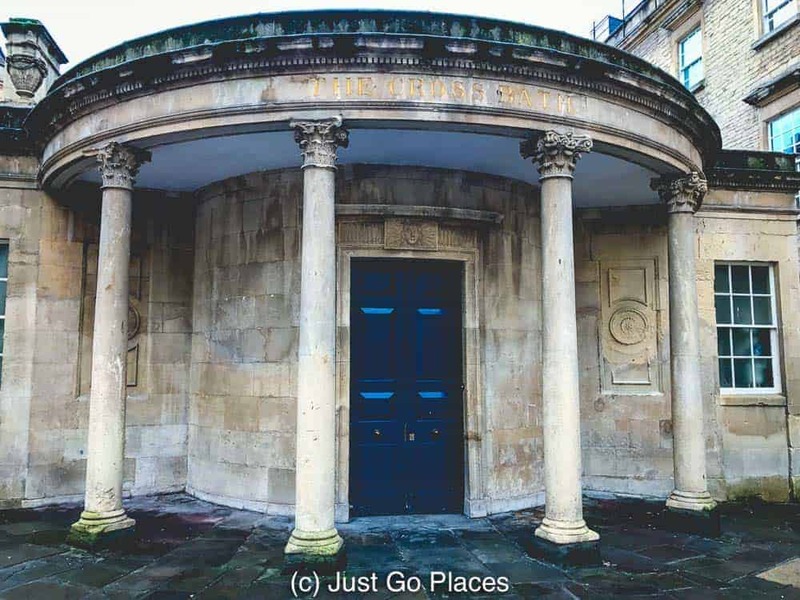 The Thermae Spa is located right in the historic centre of historic Bath near the Bath Cathedral, the Roman Baths and the Pump Room. The address is on Hot Bath Street. Yes, really. Thermae Bath spa is open every day of the year except 3 days at the end of the year (Christmas, Boxing Day and New Year’s Day). The Thermae Bath is open from 9 in the morning to 9:30 at night and the Cross Bath is open from 10 in the morning to 8 pm. You get entry into the Thermae Spa in two hour slots and the Cross Bath in 1.5 hour slots. Beauty treatments are only available at Thermae Spa. If you book a spa treatment that time is added to your two hour slot. You can also pay at entry for additional hours if you want to stay longer. Tip: If you want to avoid busy times at the spa, you should choose to go at a time other than the weekends, summer and Christmas. Christmas you say? Yes, because Bath has a wonderful Christmas market which attracts many tourists. You get complimentary towels, robes and flip-flops upon entry at both the Thermae Spa and the Cross Bath. Note there are only adult sizes for flip flops. 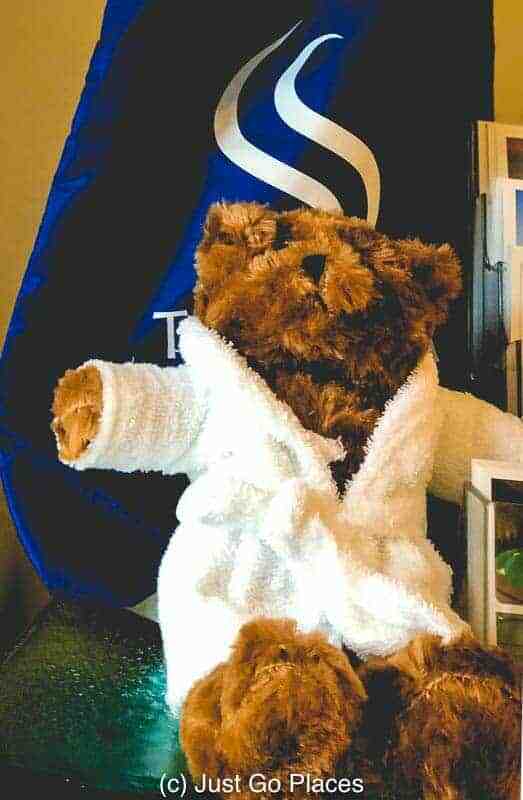 Even the teddy gets a complimentary robe to snuggle up. You can not get multiple access entries that cover both the Thermae Spa and the Cross Bath. Another Thermae Bath spa discount offer is the twilight package where you can use the spa during weekdays in the evening. Imagine watching the sunset over Bath from the rooftop pool! 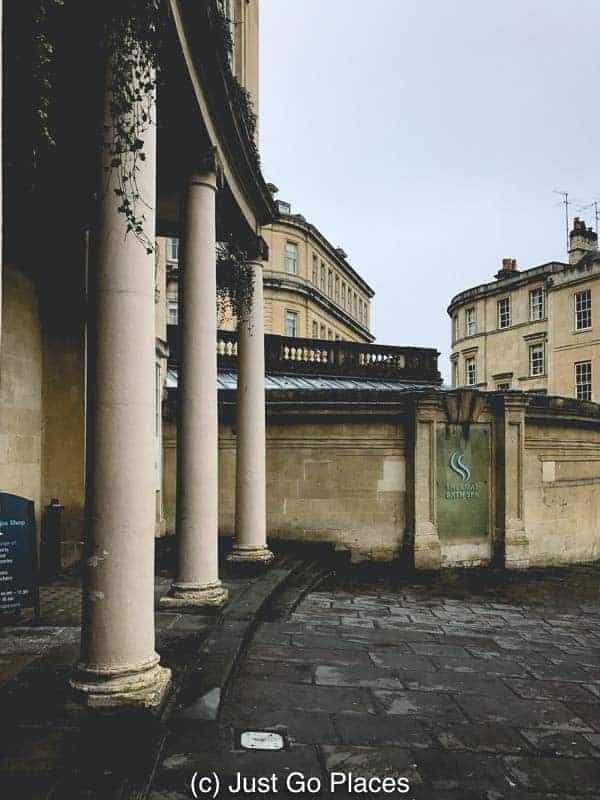 You can get also get a Thermae Bath spa discount package that includes the historic Roman Baths, a meal at the Pump Room Restaurant and a session at the Thermae Bath spa. And the best part? It doesn’t all have to be done in one day! 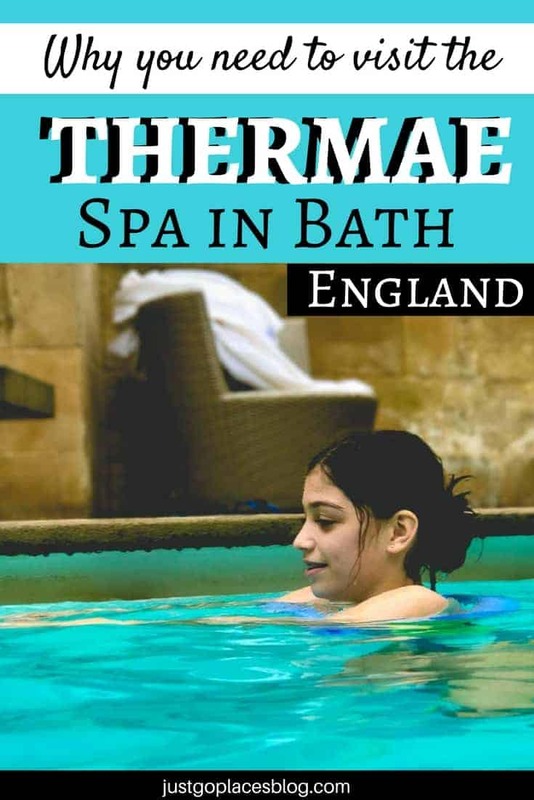 All of these Thermae spa deal offers would be great for tourists to the city who need some R&R after spending time enjoy Bath’s many attractions and walking its nearby hills. The spas are accessible for people with disabilities. The Thermae Bath Spa has an elevator for ease of access. In addition, the pools have special assistance chairs for lowering people into the baths. Children over the age of 16 are allowed access to the Thermae Spa but need to be 18 to receive spa treatments. Children from the age of 12 are allowed at the Cross Bath spa on a 1:1 adult/child ratio. My daughter enjoyed herself immensely and has gotten a promise from me that we can go to the Royal Bath Spa when she turns 16. We were guests of the Cross Bath Spa. All thoughts and opinions in this article remain strictly my own.